Brussels sprouts must surely be one of the Western world's least popular vegetables, not only with regard to children - as is the case with many other vegetables - but among people of all ages. 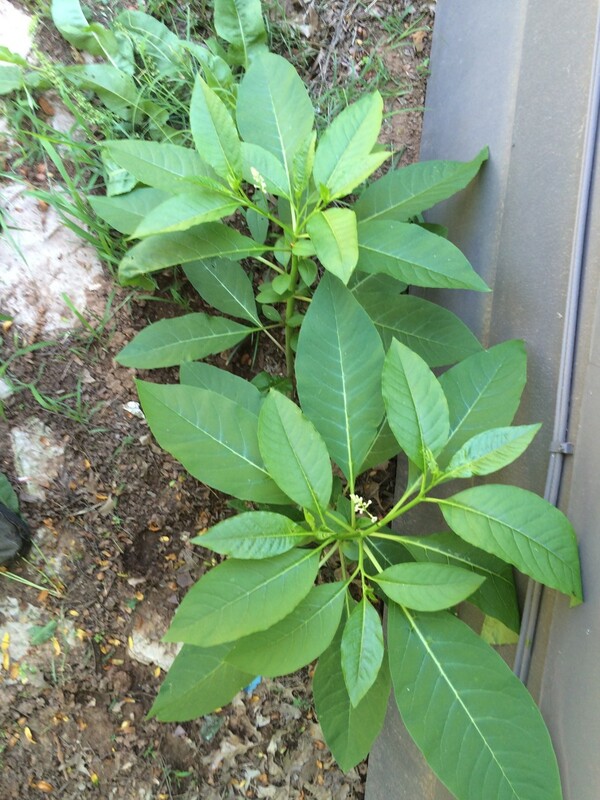 Frequently, they are presented on the Thanksgiving or Christmas table merely as a matter of tradition and completely neglected for the rest of the year. 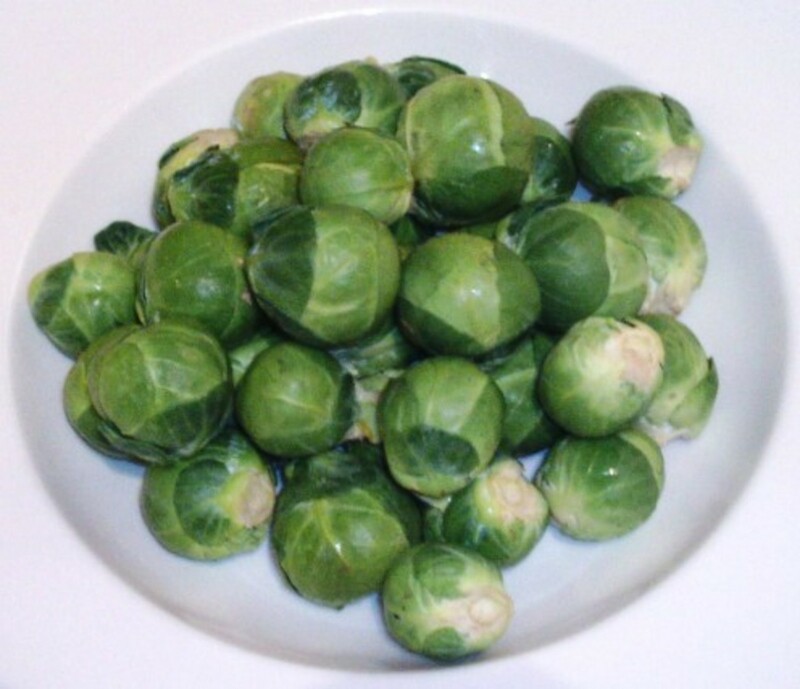 This is a great shame, as Brussels sprouts are not only fairly inexpensive when in season, they are both nutritious and delicious when cooked and served in an appropriate fashion. So why are Brussels sprouts so widely scorned and ridiculed? 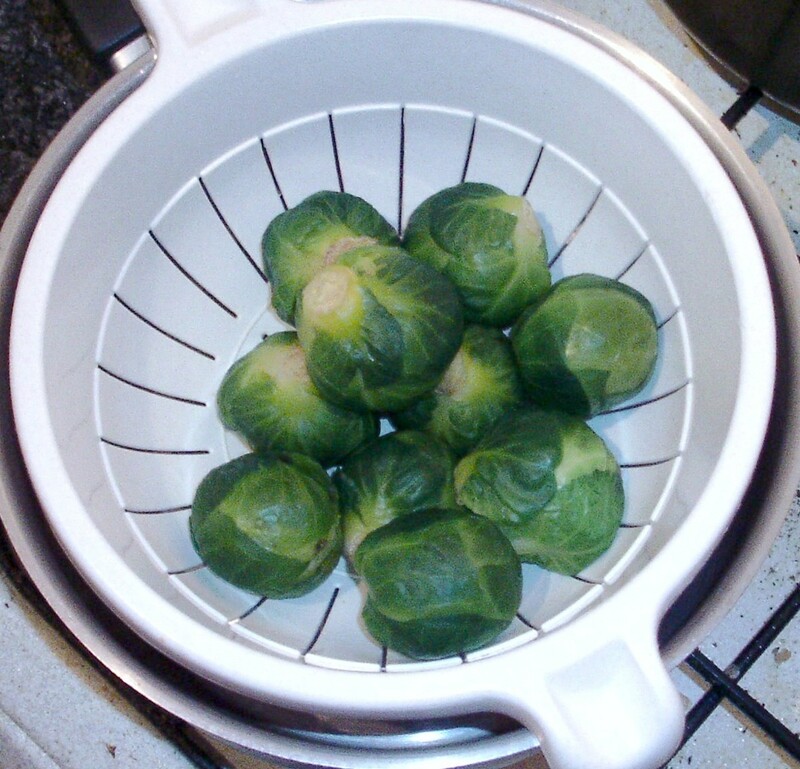 Overcooking is generally blamed for Brussels sprouts proving so unpopular. In a large number of instances, they are simply added to salted water and boiled until they are soggy, mushy and tasteless. This also serves to allow their nutritional value to escape in to the poaching water and be flushed down the drain. 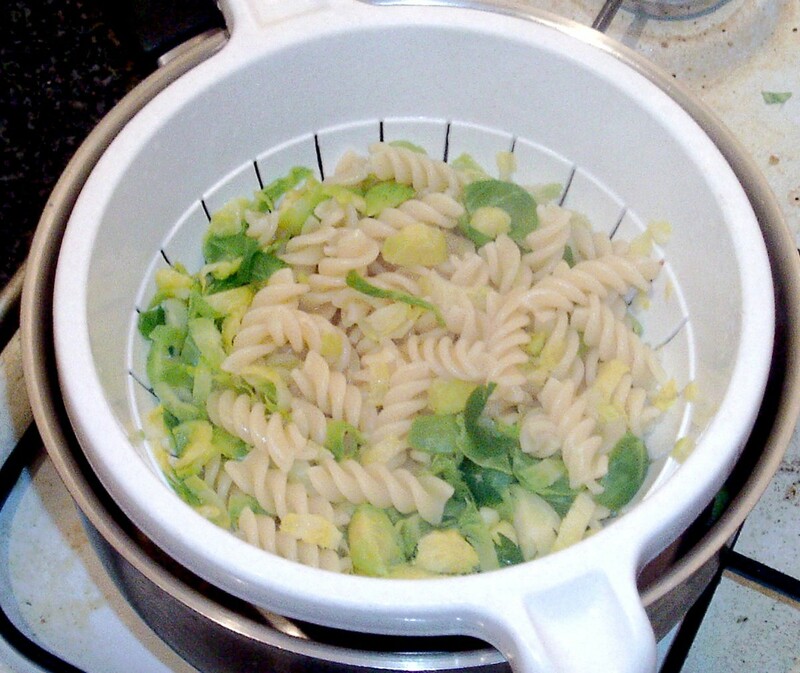 If cooking sprouts in this way, they should be added to boiling water and simmered for no more than five or six minutes so that they are served firm, tasty and nutritious. 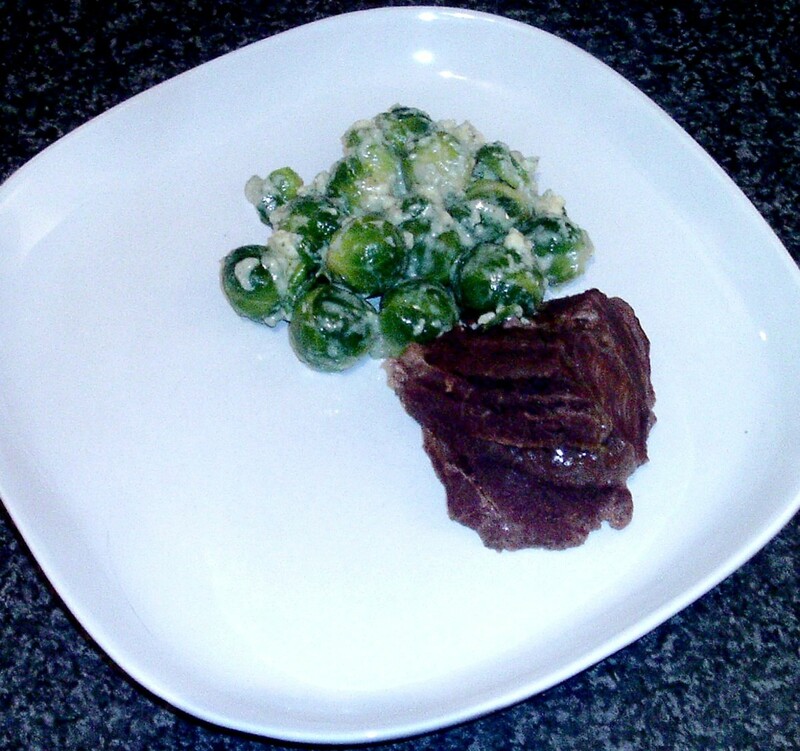 It is also important not to make the two cuts to form a cross in the base of uncooked sprouts as this serves the sole purpose of causing many of the sprouts to lose their outer leaves as they cook. 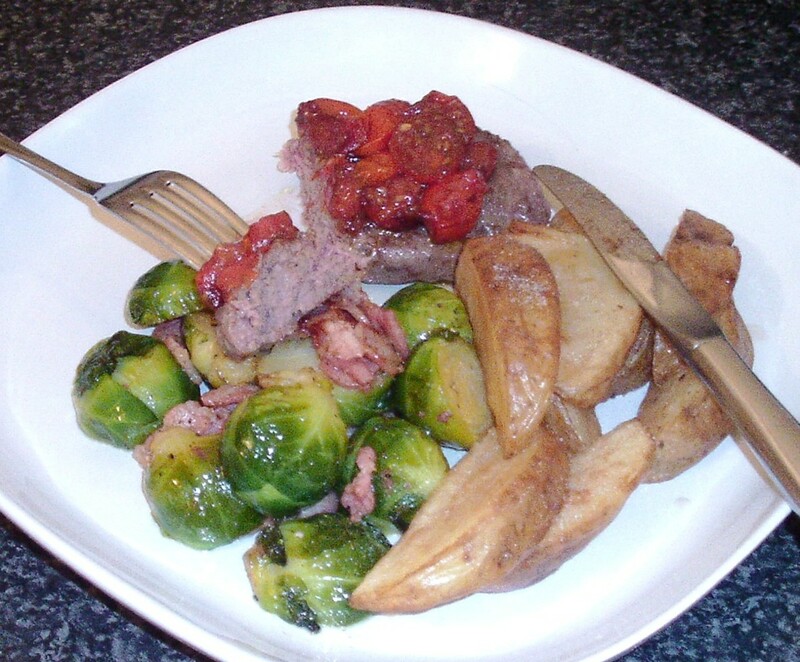 A far better way however to get your family to eat and most importantly enjoy Brussels sprouts is to vary the cooking methods and experiment with a variety of serving suggestions. It is most of all to this consideration that the recipes featured below are dedicated. If you are looking to quickly find any particular recipe on this page, you can use the handy links in the table of contents featured immediately below. Trim any damaged part from the stalks of the Brussels sprouts. Add them to a pot of boiling, salted water to simmer for five minutes only. Peel the onion and slice it in half, down through the core. Lay each half flat and slice across the way. Peel and finely slice the garlic cloves. Pour the vegetable oil in to a large pot and put it on to a medium heat. 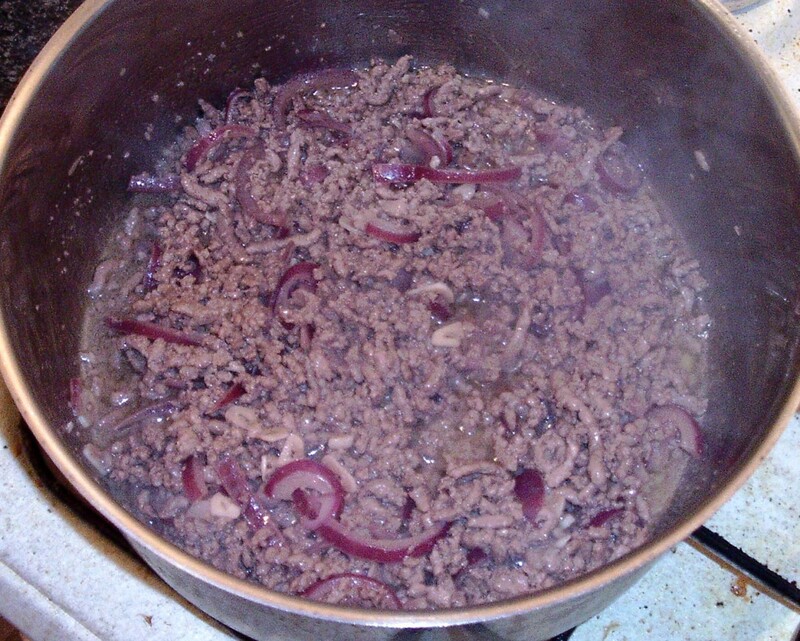 Add the onion and garlic and saute gently for two or three minutes until the onion is just softened. 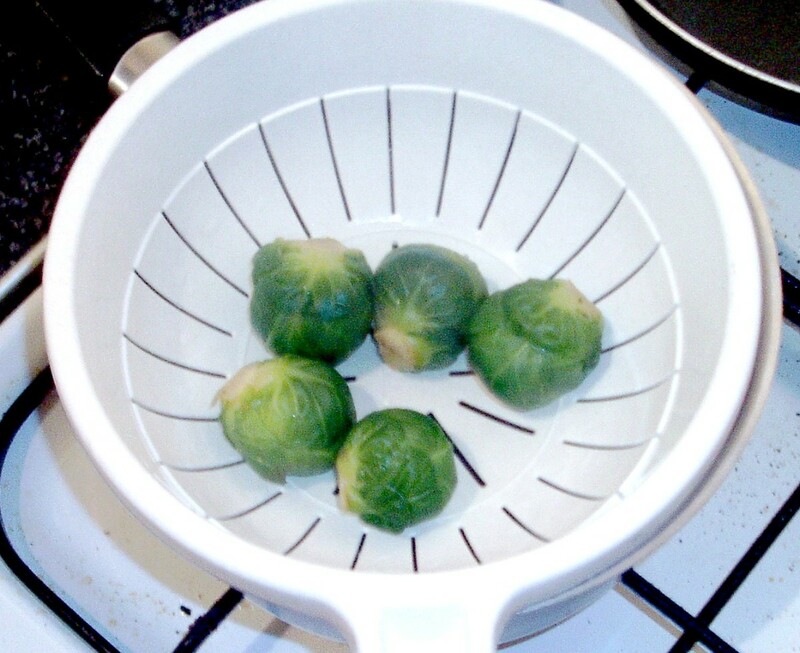 Drain the sprouts through a colander and set aside to cool. 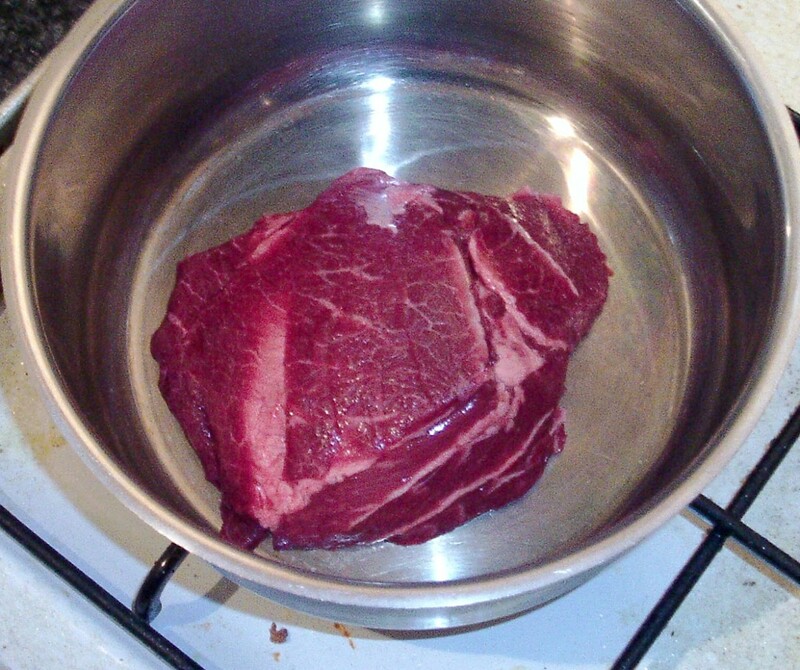 Add the beef to the main cooking pot and break it up with a wooden spoon. Saute for a further few minutes until it is evenly browned and sealed. Seed the bell pepper and slice to a thickness of around half an inch. 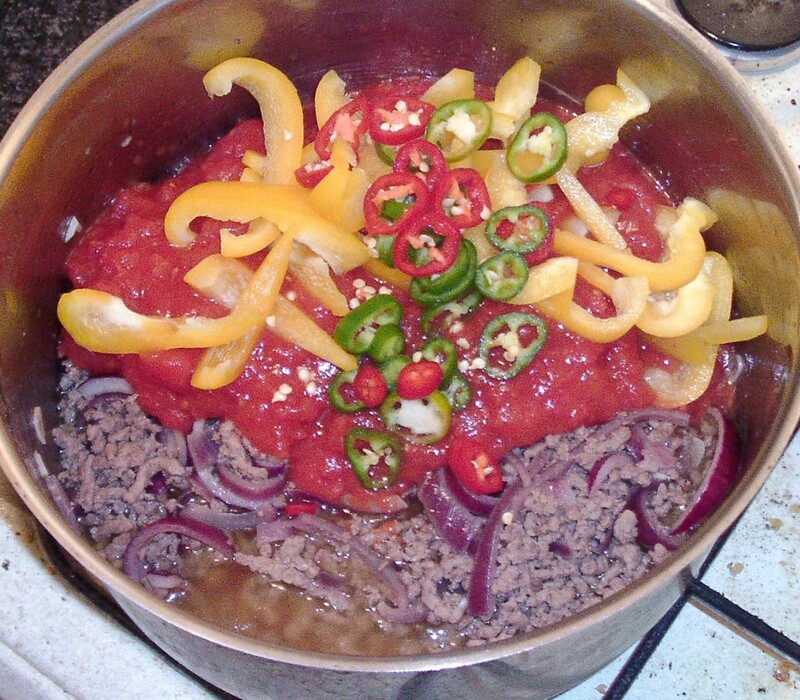 Top the chillies and slice moderately thinly in to discs. 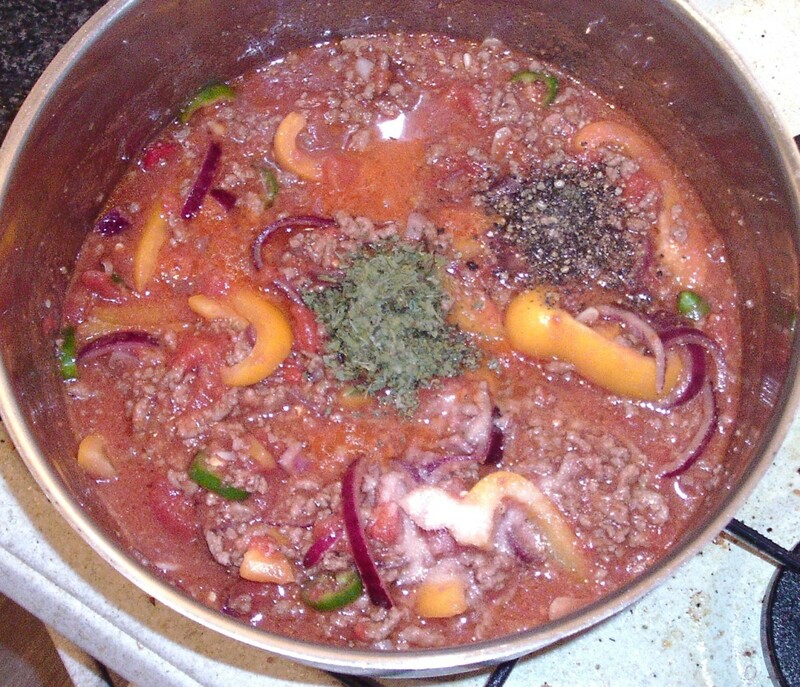 Pour the tomatoes in to the pot and add the sliced pepper and chillies. Stir well. 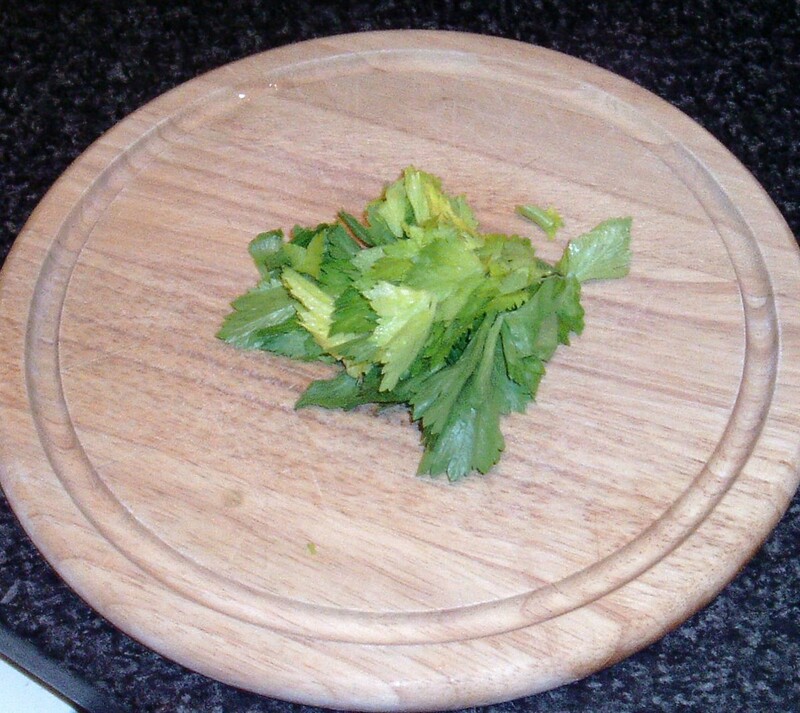 Add the dried coriander leaf and season with salt and plenty of black pepper. Stir again and turn up the heat until the liquid approaches boiling. 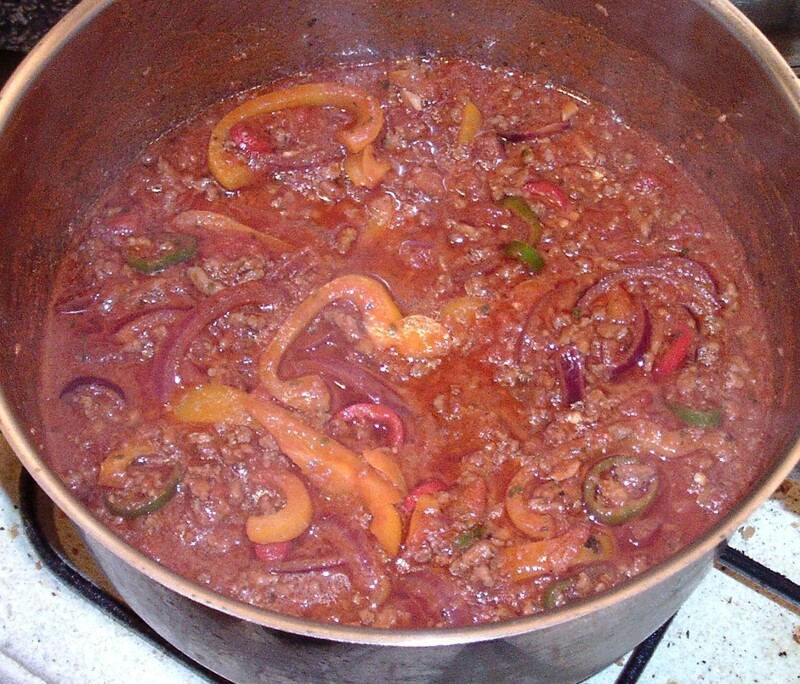 Reduce the heat to achieve a gentle simmer, Cover the pot and cook in this way for thirty minutes. Season a large pot of cold water with salt and the ground turmeric. Put it on to a high heat to come to a rolling bowl. Wash the rice in a sieve under running cold water and add it to the boiling water when the chilli has simmered for thirty minutes. Stir well and adjust the heat to maintain a gentle to moderate simmer for ten minutes. 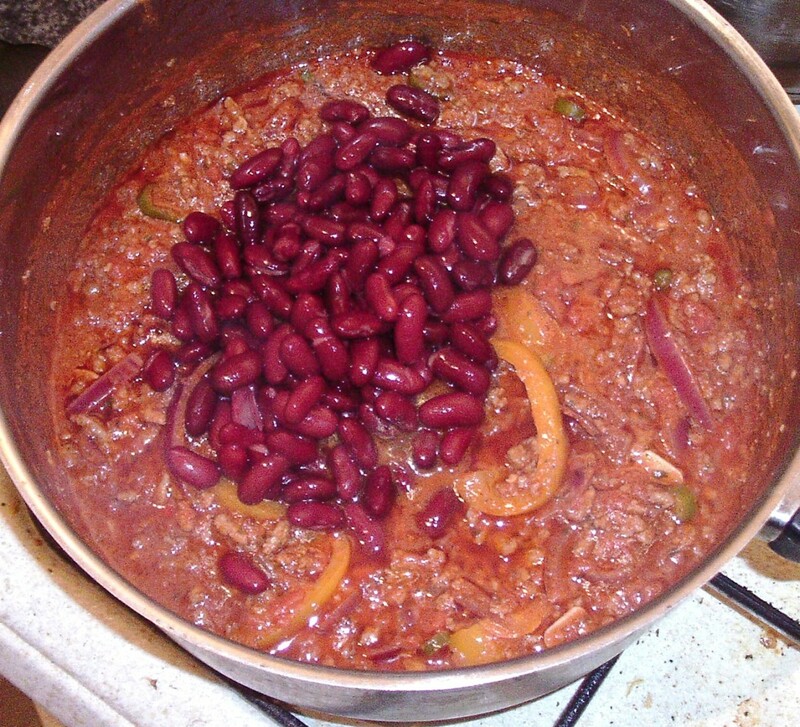 Rinse the beans through a colander and add to the chilli. Stir them through. 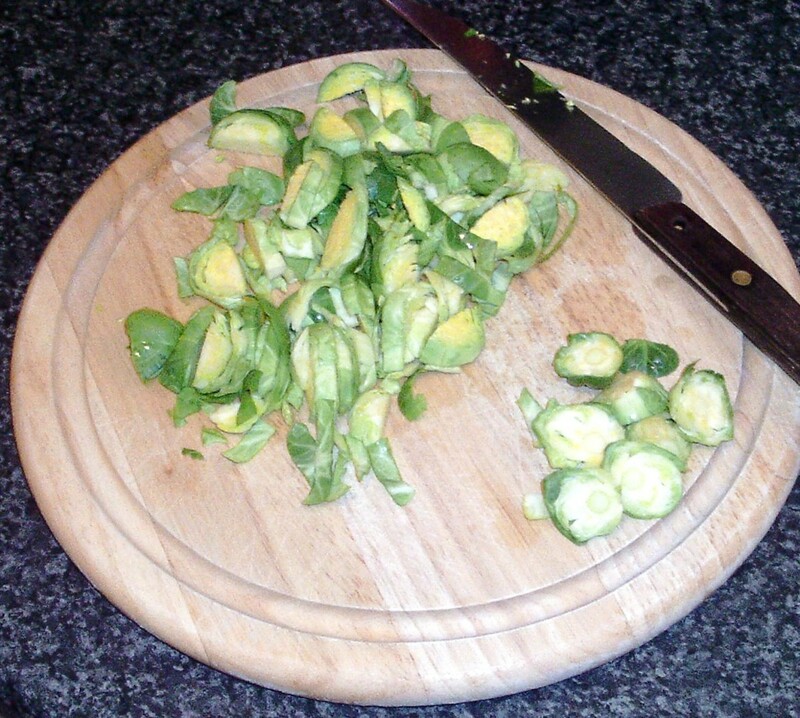 Cut the sprouts in half down through their central cores and also add to the pot, stirring everything together. Bring back to the simmer until the rice is ready to serve. 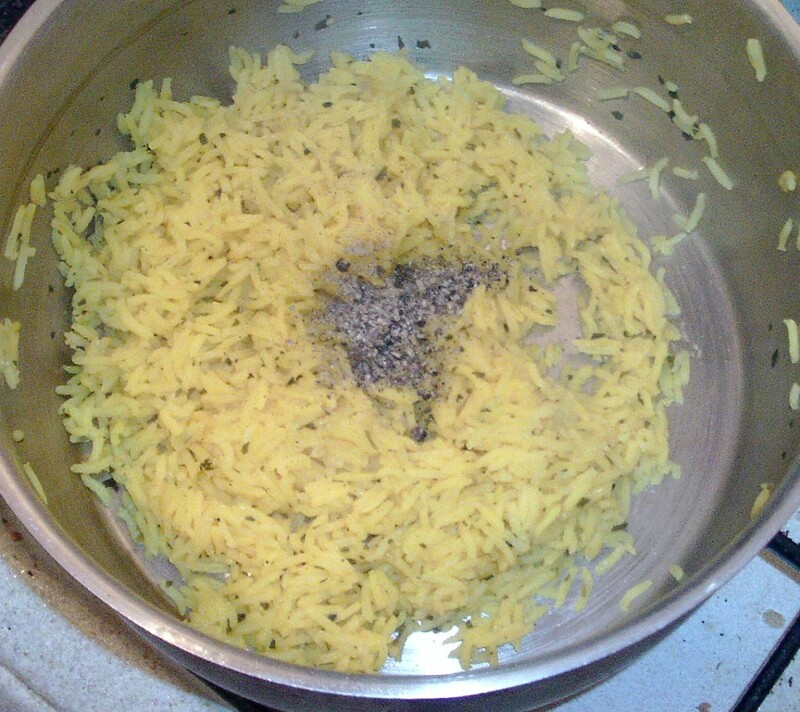 Drain the rice well and allow it to steam off for two to three minutes before returning to the pot and seasoning with black pepper. Fluff it up and combine the pepper with a fork. 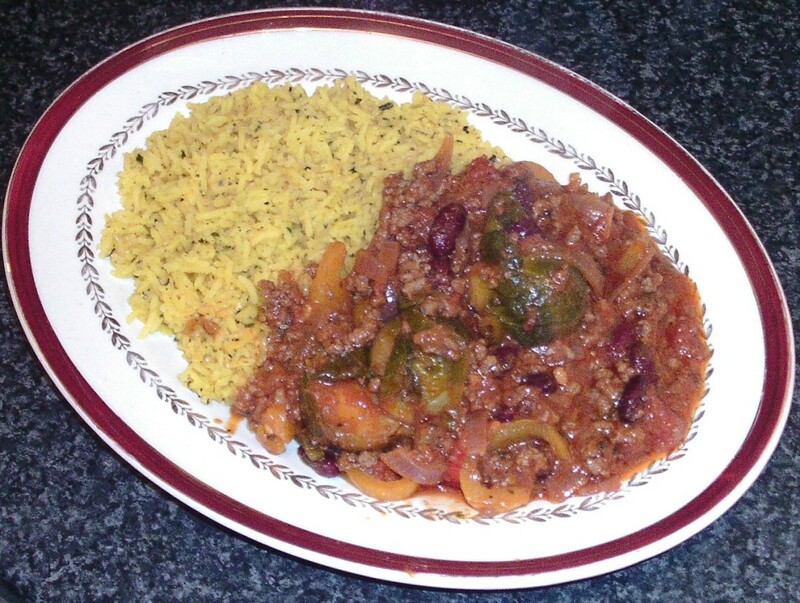 Plate the rice with the chilli either alongside or on top. Wash the sprouts and pat them dry with kitchen paper. Trim away the very ends of the stalks and half them through the core. 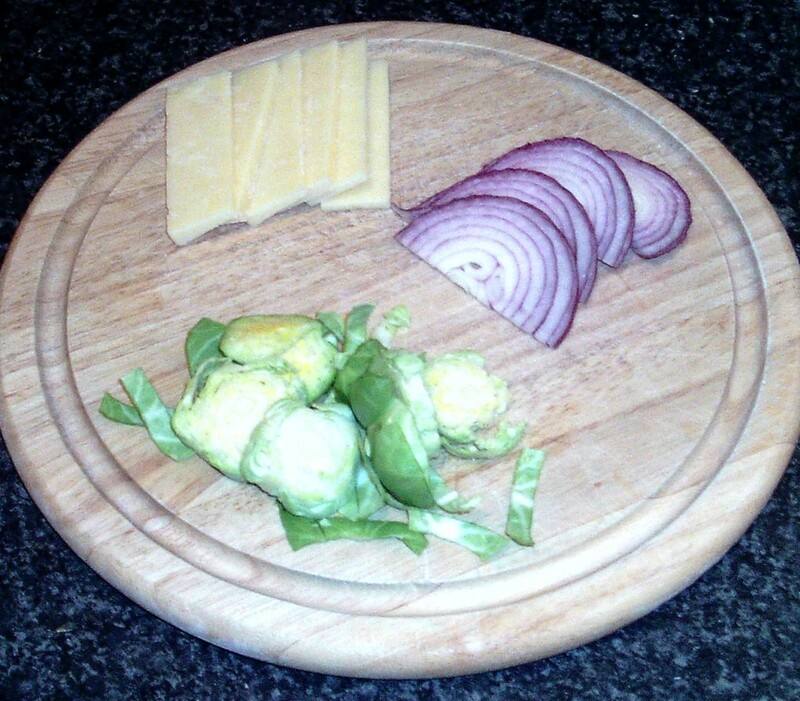 Lay each half flat on a chopping board and moderately thinly slice. Slice the bacon rashers/slices to approximately half inch strips. 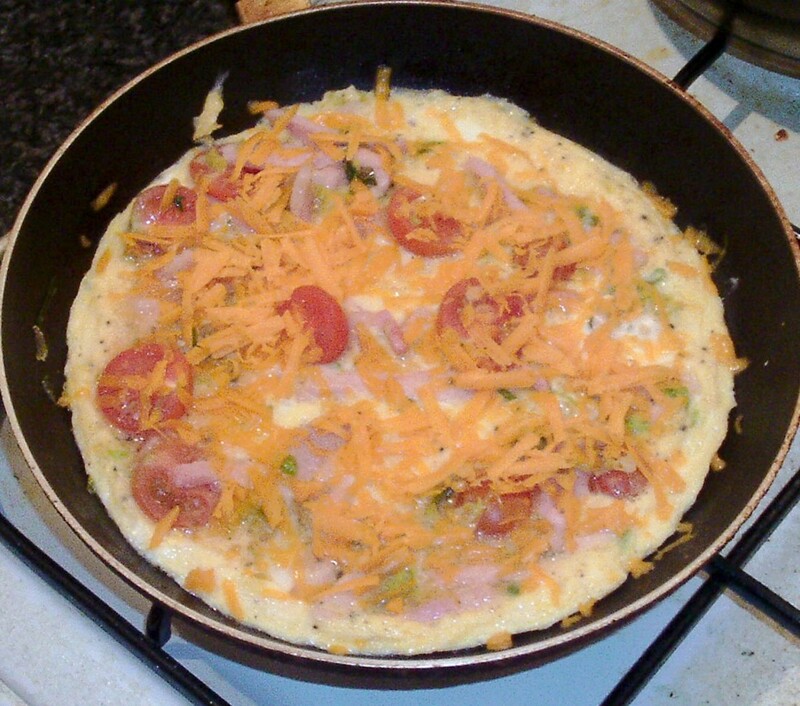 Pour the vegetable oil in to a small omelette pan and put the pan on to a medium heat. 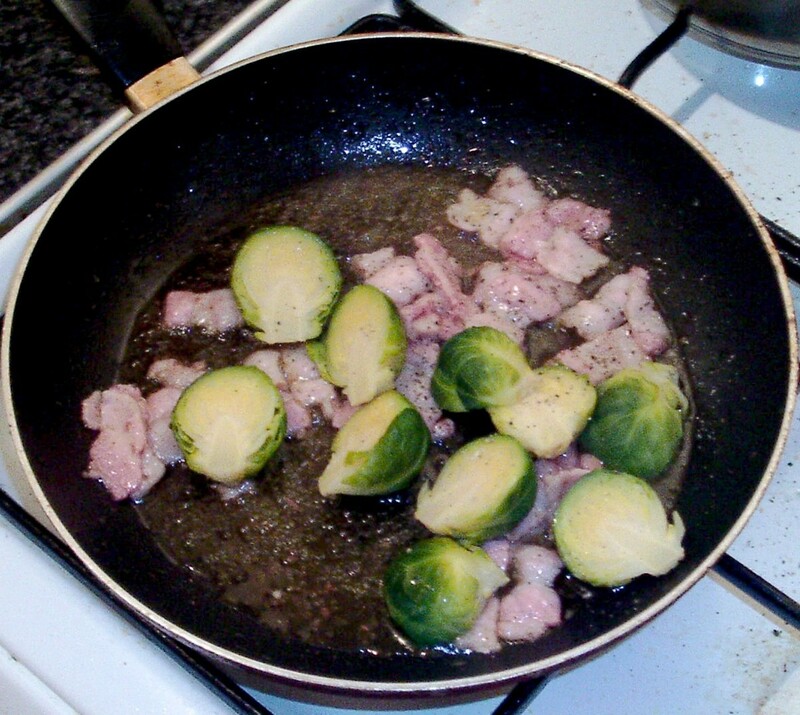 Add the bacon and sprouts and saute for a couple of minutes until the bacon strips are cooked and the sprouts are softened. 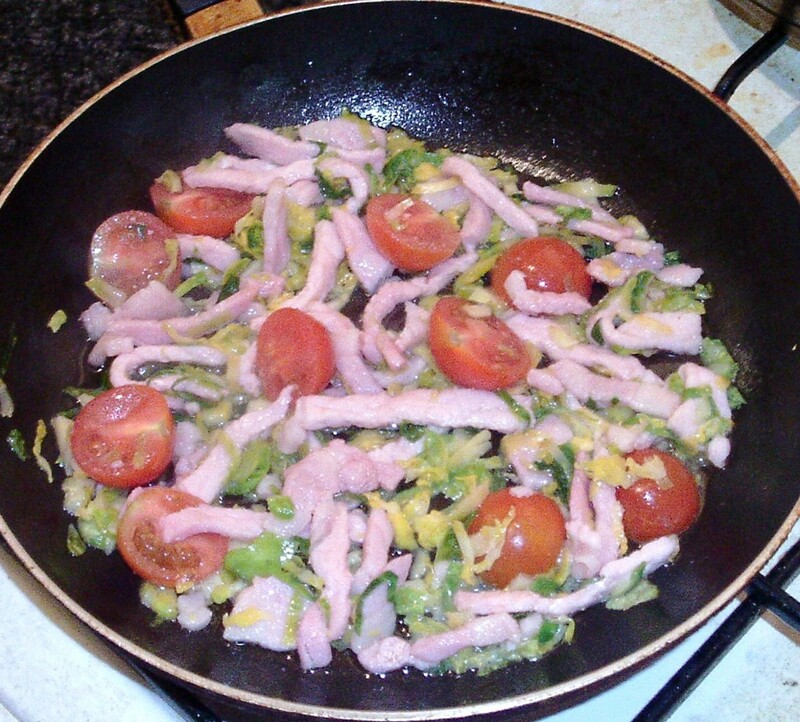 Wash and dry the tomatoes, cut them in half and add them to the pan for a final thirty seconds or so of stir frying. 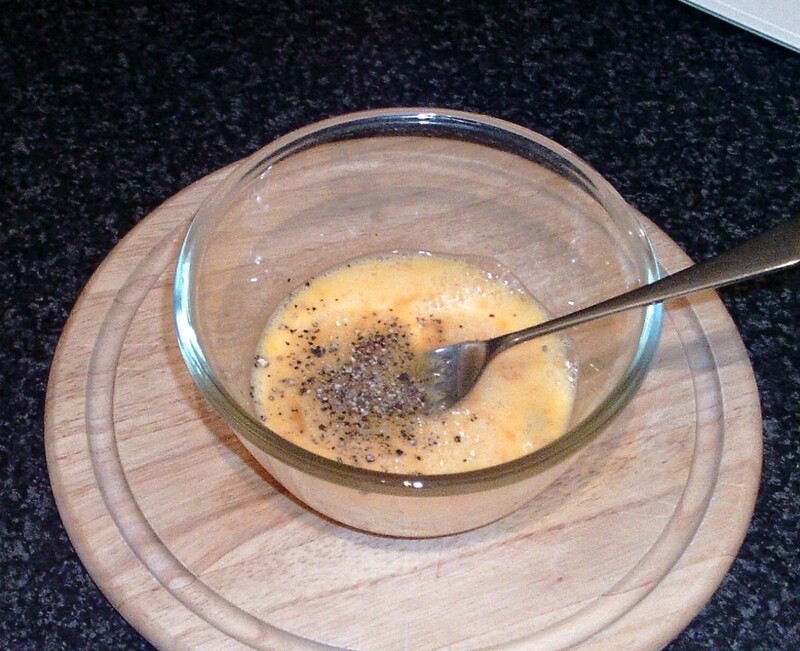 Break the eggs in to a bowl, beat with a fork until just combined and season with some black pepper. 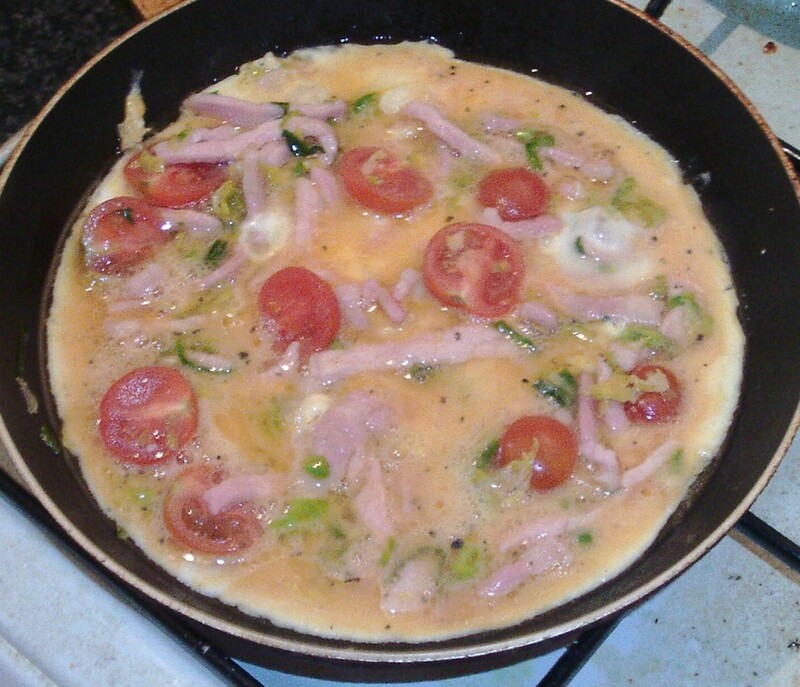 Make sure the bacon, sprouts and tomatoes are evenly spread over the base of the pan before carefully pouring over the beaten egg. Put your kitchen grill/broiler on to preheat to its maximum setting. After a few minutes and when you can see the egg is set almost but not quite all the way to the top, place the pan under the grill/broiler to complete the setting process. 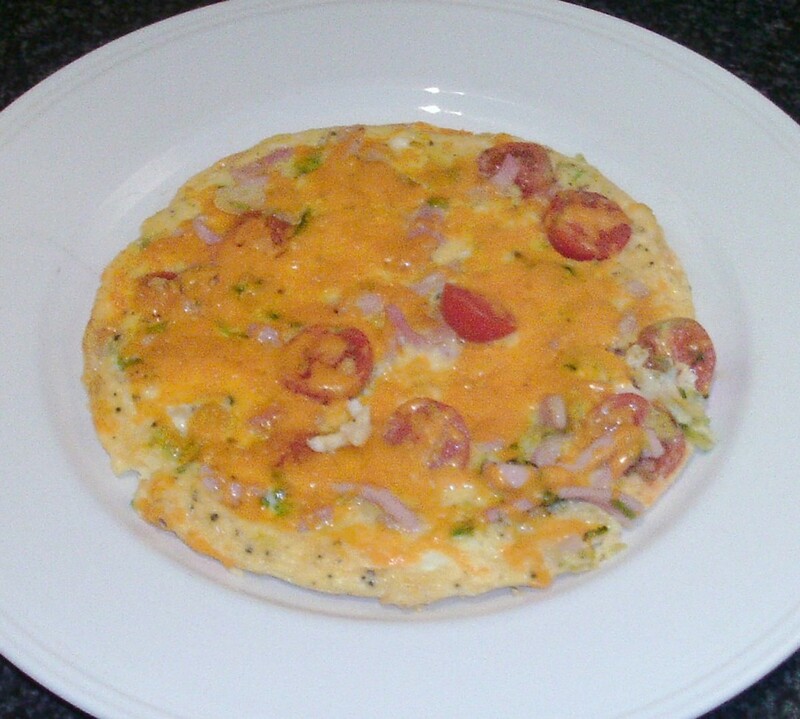 When the egg is fully set, scatter the tortilla with the cheese and place it back under the heat until the cheese is melted and bubbling. Slide the tortilla from the pan on to a plate. In this serving instance, it was then sliced like a pizza in to six wedges, with three wedges being served per person along with some potato crisps/chips. Put your oven on to preheat to 400F/200C/Gas Mark 6. 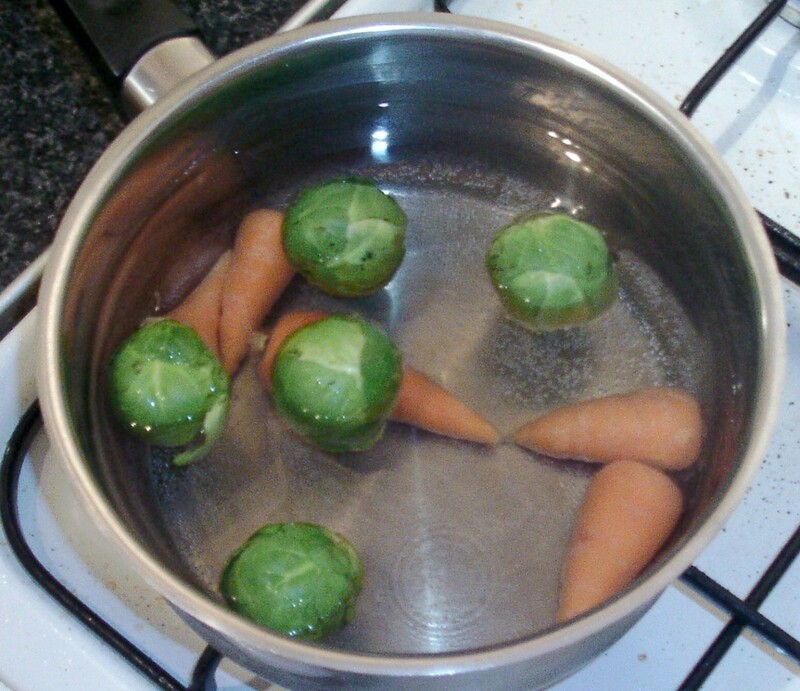 Scrub the carrots and wash the sprouts. 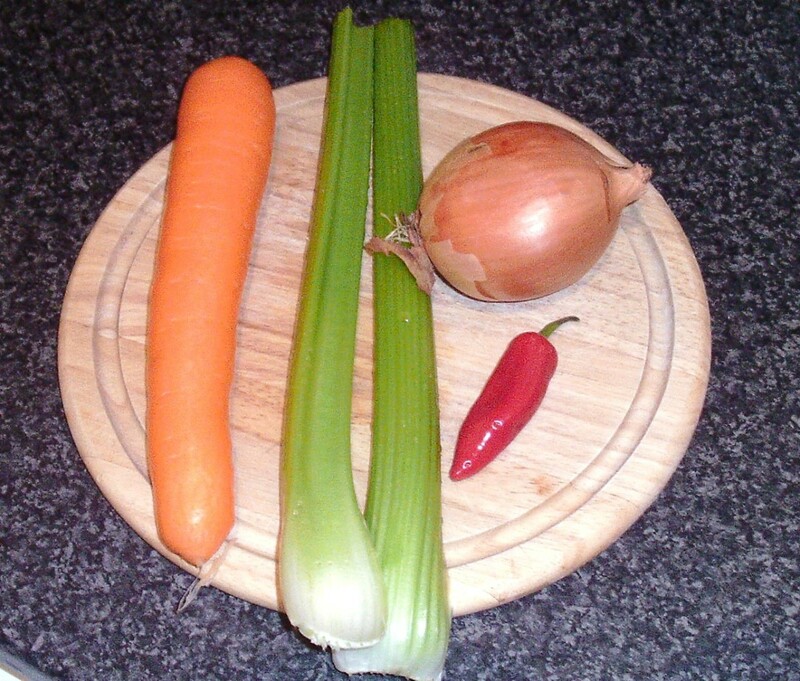 You could at this stage trim the tops off the carrots but they are deliberately left whole in this instance for presentation purposes. The remaining stalk portion is of course not eaten. Trim the very end of the sprout stalks. 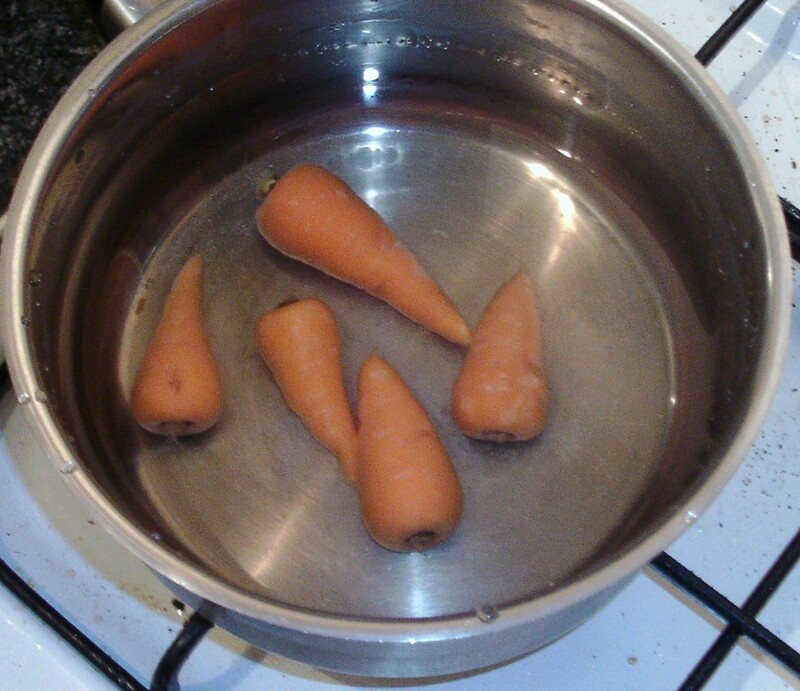 Put the carrots only in to a pot of cold, salted water and the pot on to a high heat until the water boils. Reduce the heat to achieve a modest simmer. 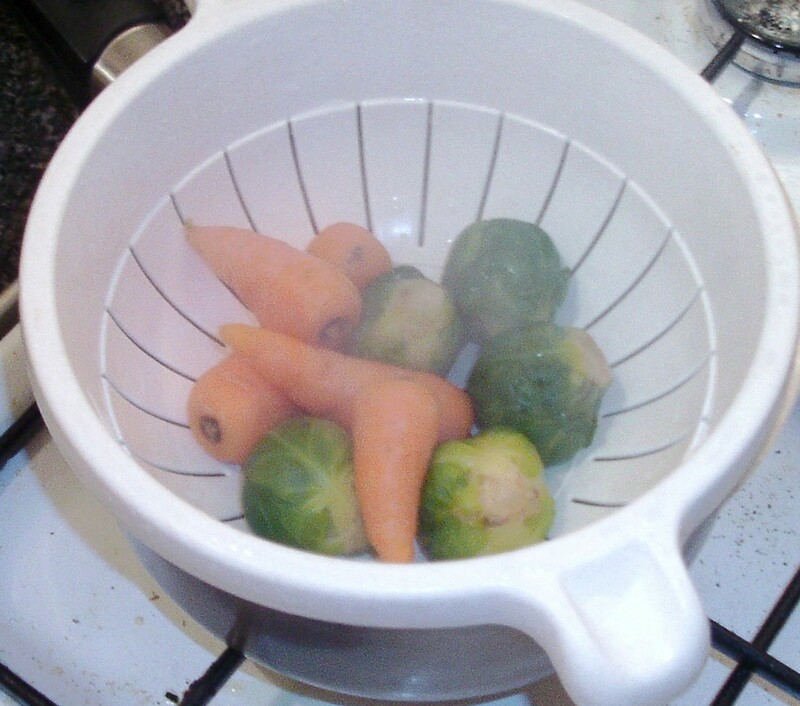 When the carrots have been simmering for five minutes, add the sprouts and simmer for five further minutes before draining and setting aside to cool. 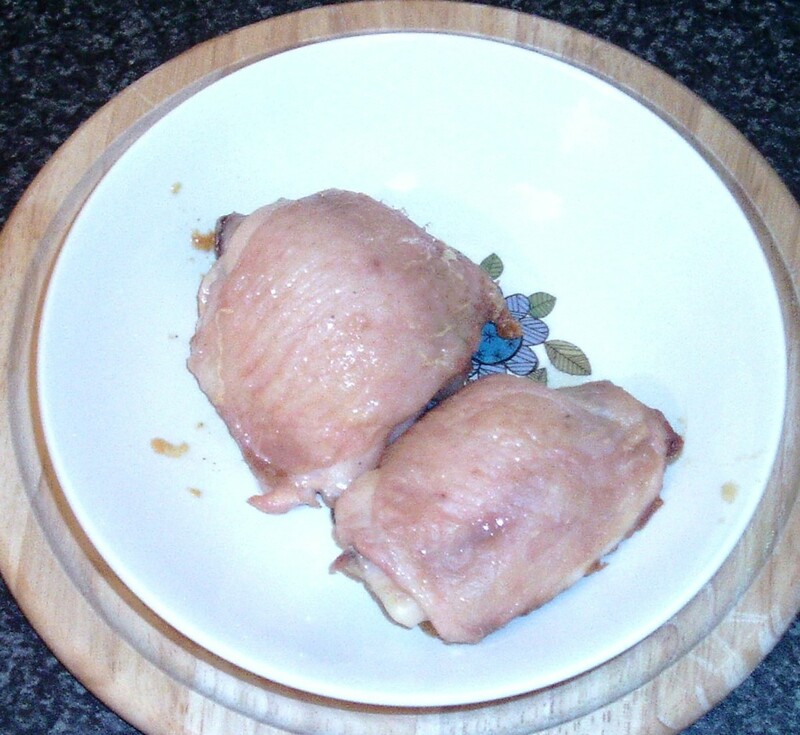 Season the chicken thighs on their flesh sides with salt and pepper and lay them flesh sides down on a lightly oiled roasting tray. Rub the skins with olive oil and season with salt before placing in to the oven for twenty-five to thirty minutes until the skin is crisp and golden. 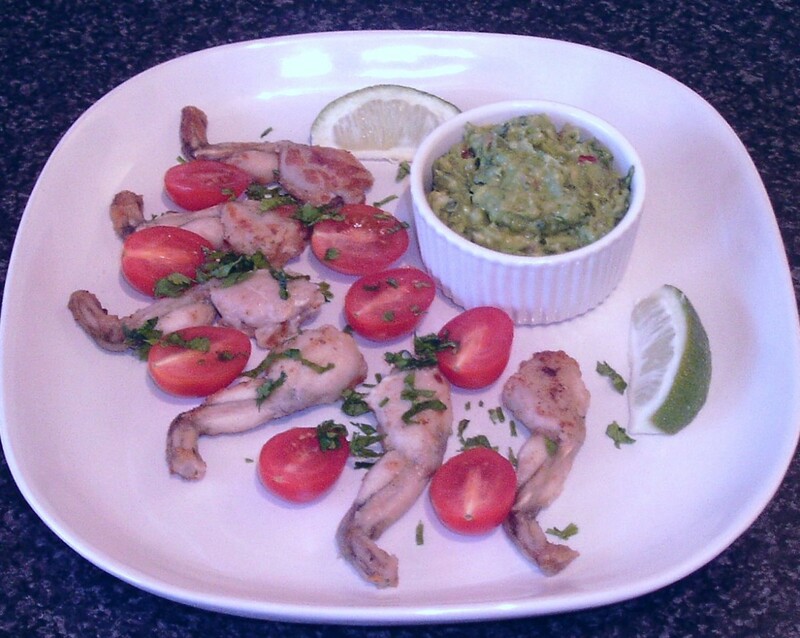 Take them from the oven and pierce the flesh with a skewer to ensure the juices run clear and they are fully cooked. If not, return them to the oven and cook for five more minutes before testing for a second time. Lift the thighs to a warmed plate and cover with foil to let them rest. 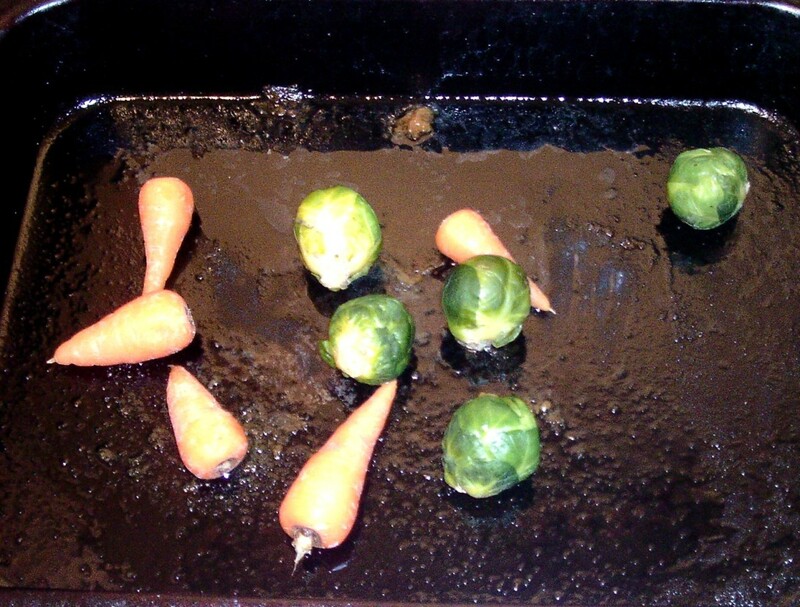 Put the sprouts and carrots in to the tray with the chicken juices and turn them around to evenly coat. Roast in the oven for ten minutes. 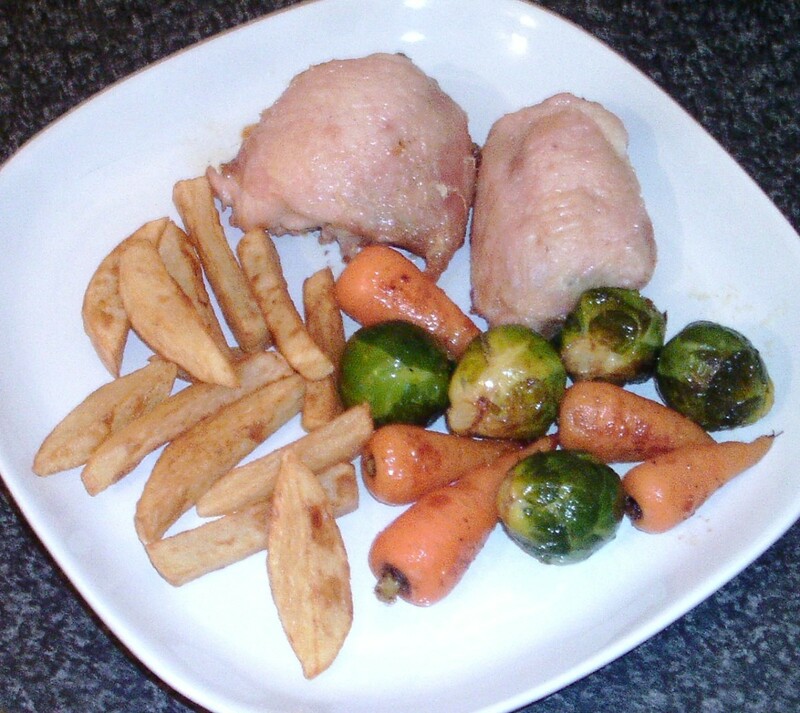 Plate the chicken thighs, sprouts and carrots along with serving accompaniment(s) of choice. 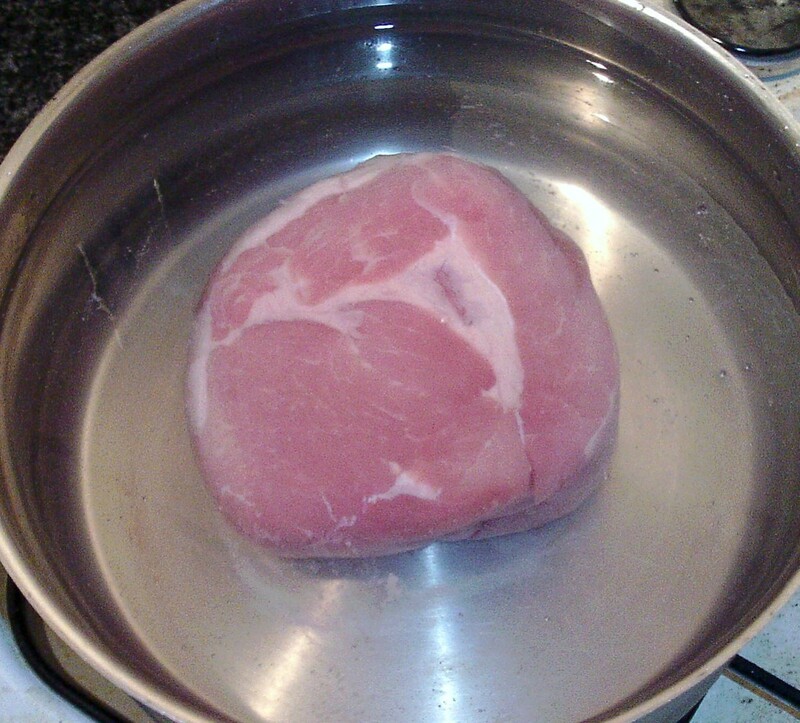 Sit the ham in a large soup or stock pot and add enough cold water to comfortably cover. 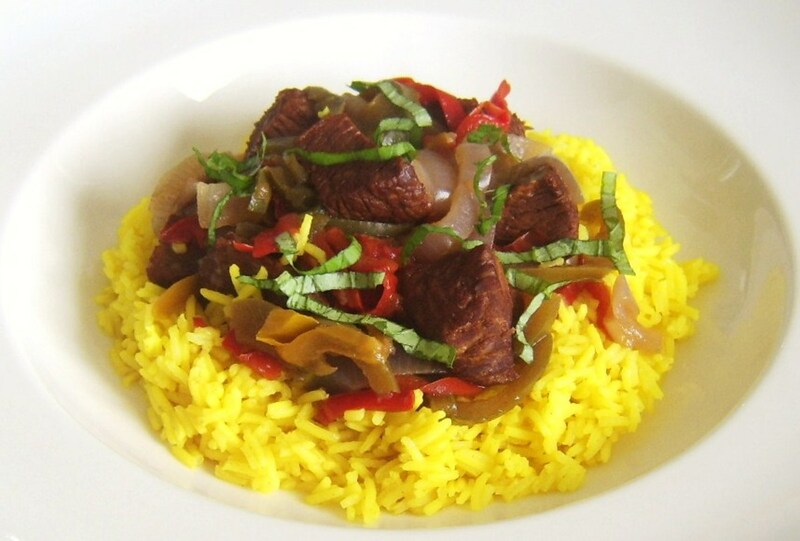 Do not add anything else at this stage as this initial procedure is simply to cleanse the meat of excess salt. Put the pot on a high heat just until the water starts to boil. 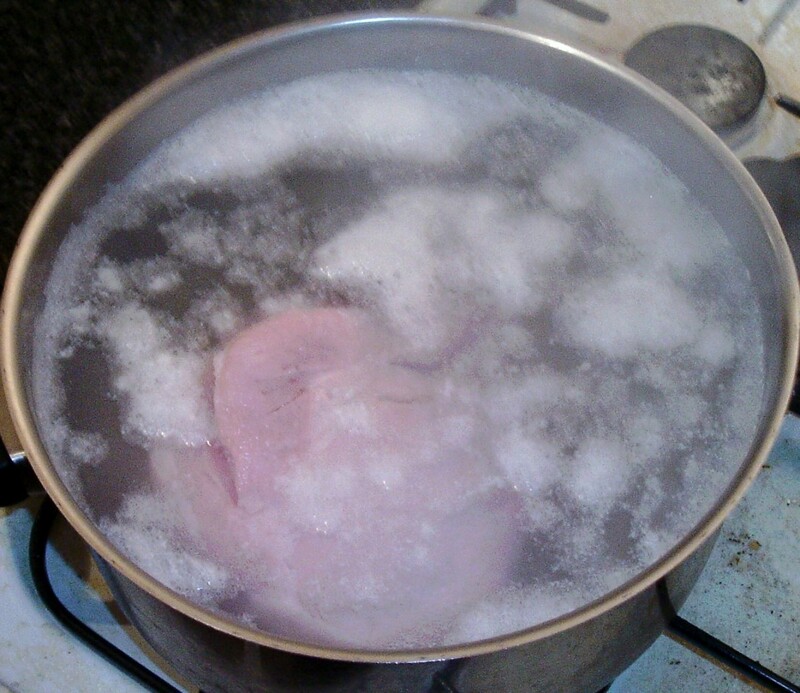 While the ham is coming to an initial boil, wash the celery sticks and carrot and roughly chop. Peel the onion and chop in to quarters. Cut away and discard the top of the chilli. Roughly chop the main body. 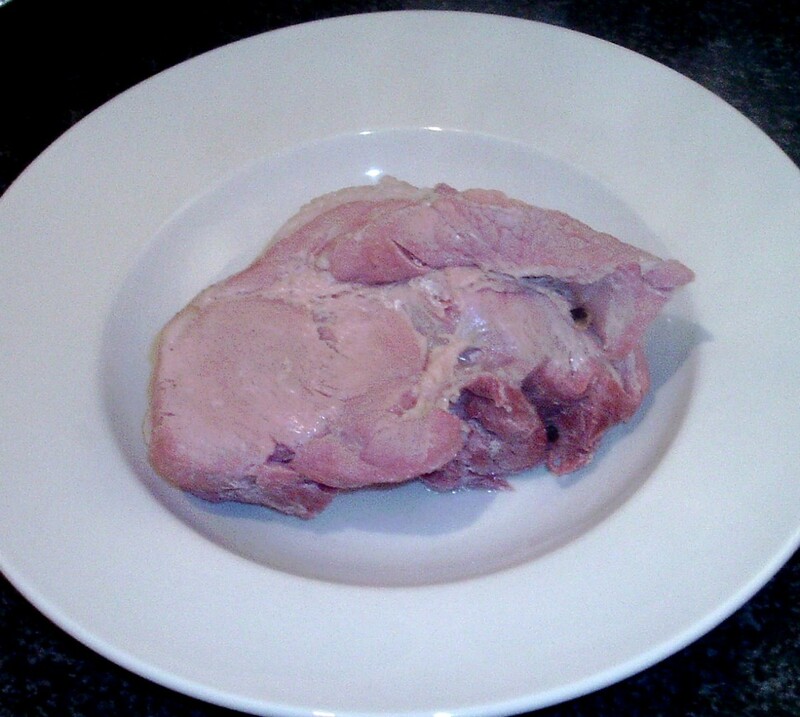 Lift the ham from the water with a carving fork and large slotted spoon to a plate. Carefully discard the boiling water and rinse out the pot. 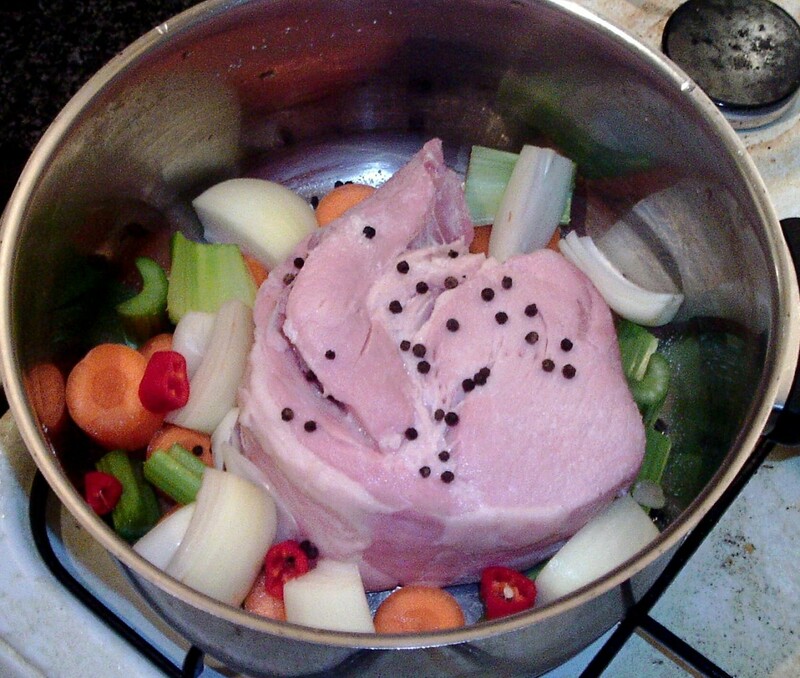 Using the fork and slotted spoon again, lift the ham back in to the pot. 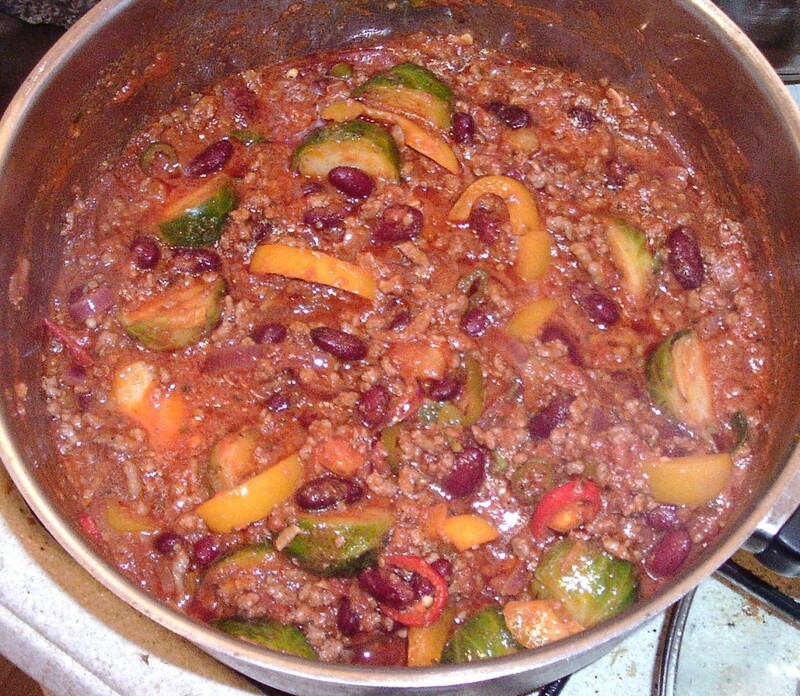 Add the prepared vegetables and the whole peppercorns before pouring in enough fresh cold water to comfortably cover. Put the pot on to a high heat until the water starts to simmer. Cover and adjust the heat to maintain a gentle simmer for one and a quarter hours. Lift the ham from the pot with the carving fork and slotting spoon to a plate, Cover and leave to rest and partly cool for a minimum fifteen minutes. 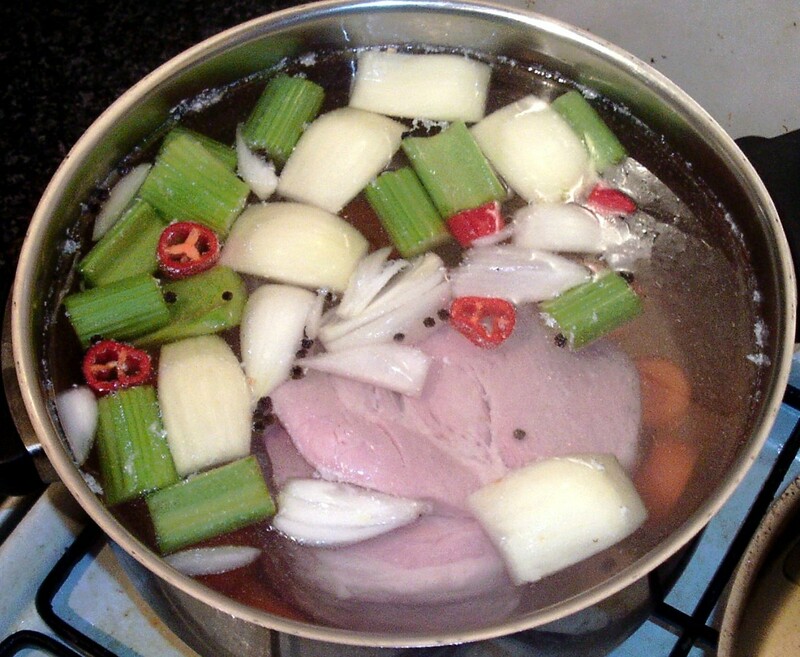 As soon as the ham has been removed from the cooking pot, use a slotted spoon to remove and discard all the stock cooking solids. 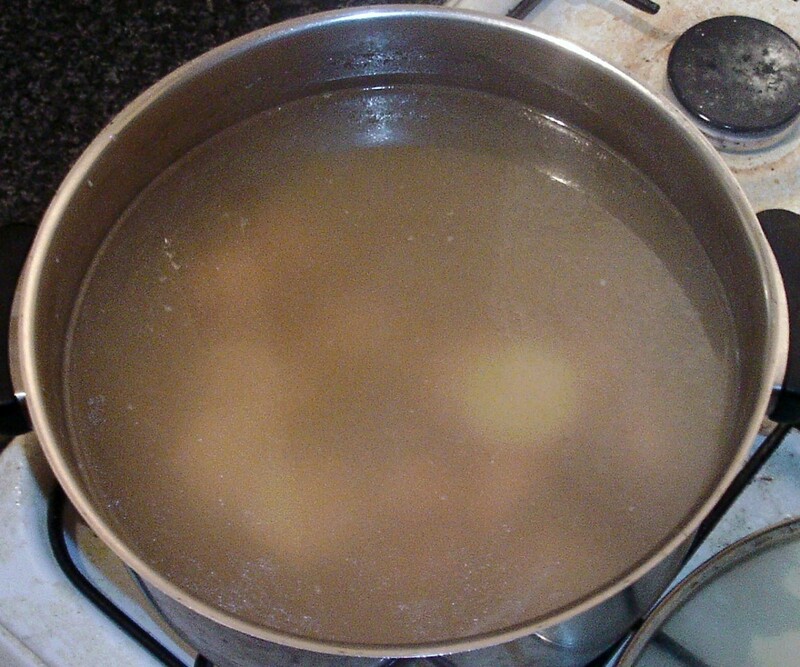 Wash the potatoes and cut them in half across the way before adding them to the hot stock. Bring the stock back to a simmer for twenty-five minutes. 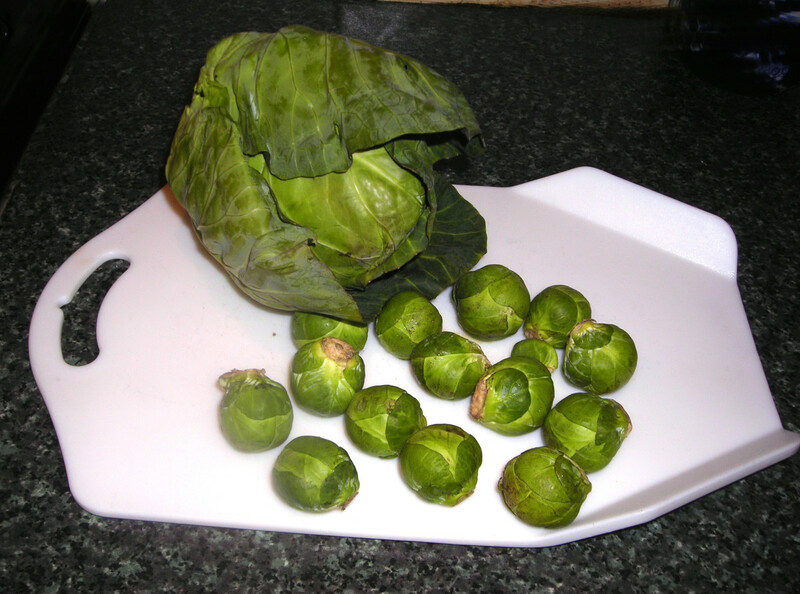 Wash the sprouts, trim the stalks if necessary and cut them in half down through the central core. When the potatoes have been simmering for ten minutes, add the sprouts to the pan and simmer for five minutes before removing to a plate and allowing them to steam, partly cool off and dry out for five further minutes. Put your kitchen grill broiler on to preheat to maximum. Two forks should be used to roughly shred the piece of ham. 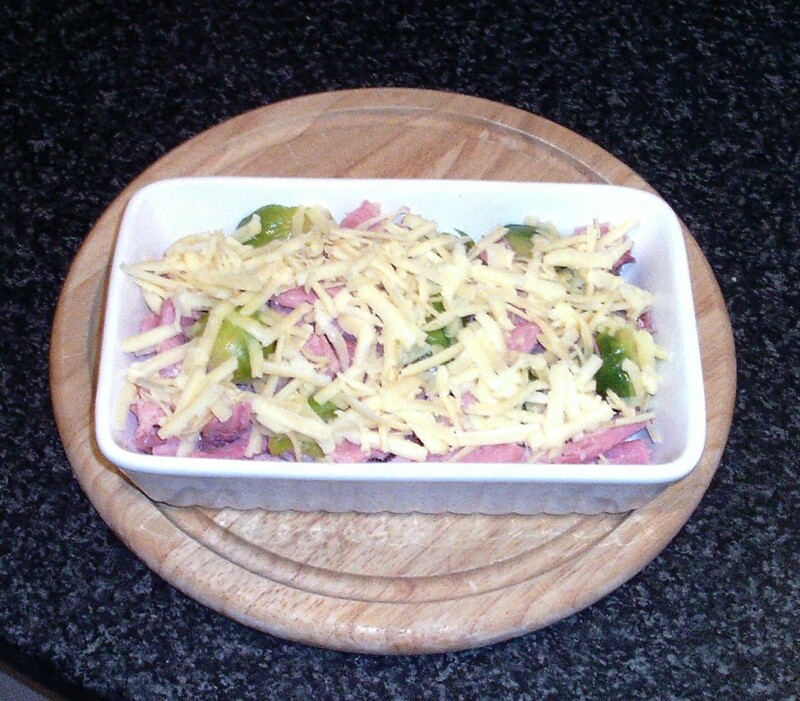 Combine the sprout halves and handful of ham in a suitable deep (and heatproof) serving dish. 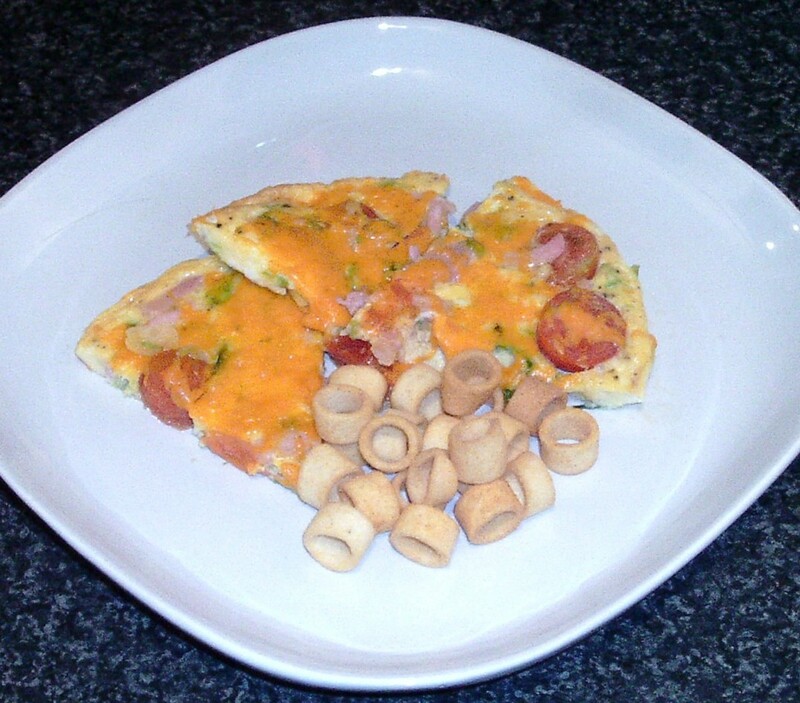 Scatter with the grated cheese. 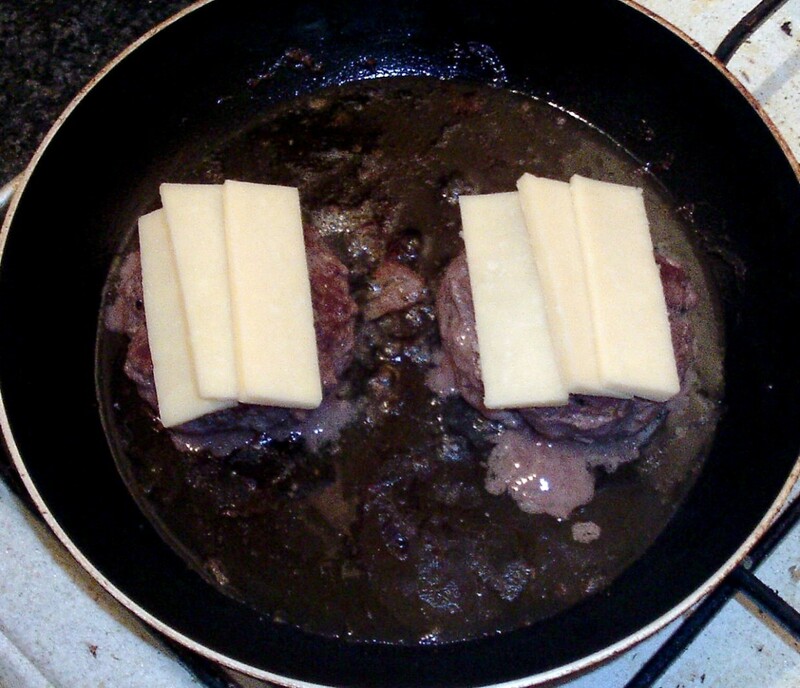 Place the dish under the grill until the cheese is melted and bubbling. 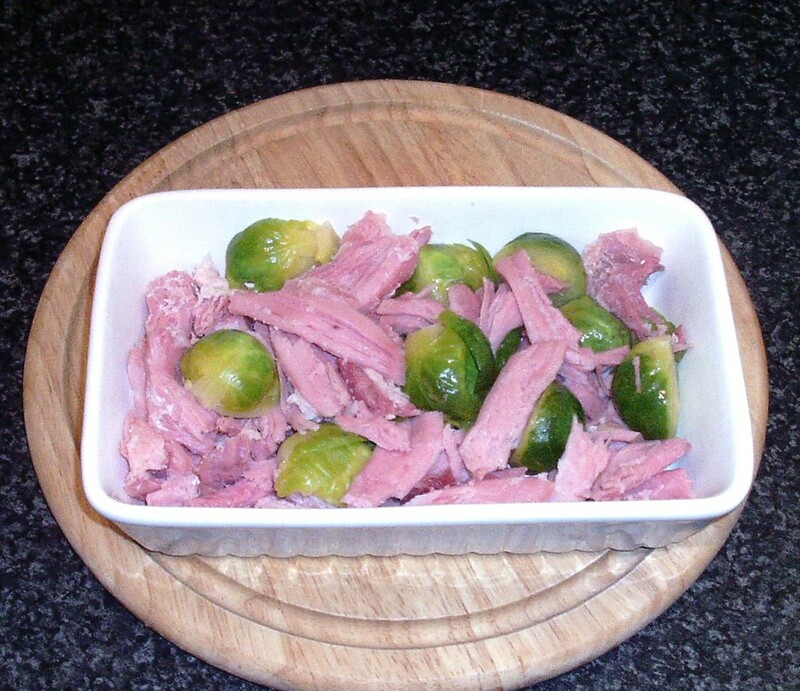 Scatter some black pepper over the sprouts and ham before placing the dish on a larger serving plate. 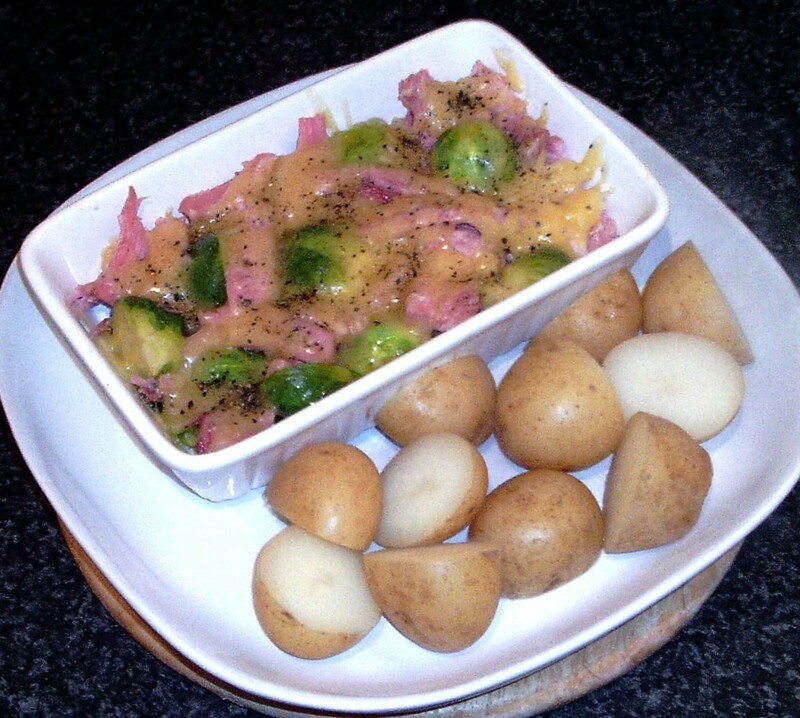 Lift the cooked potatoes from the stock with a slotted spoon and allow them to steam off for a couple of minutes on a holding plate before plating with the ham and sprouts. 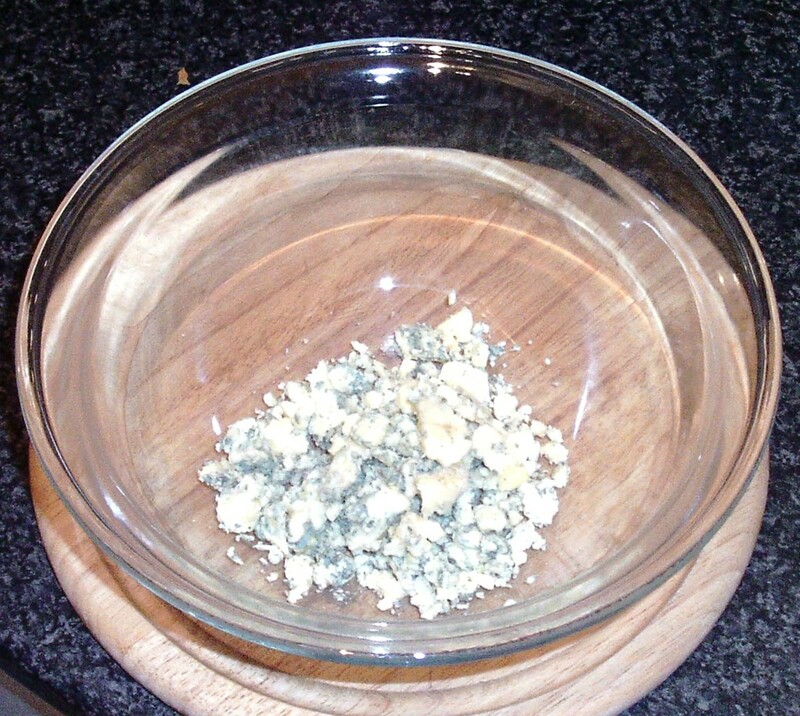 Strain the warm stock carefully through a kitchen paper lined sieve and in to a large bowl. 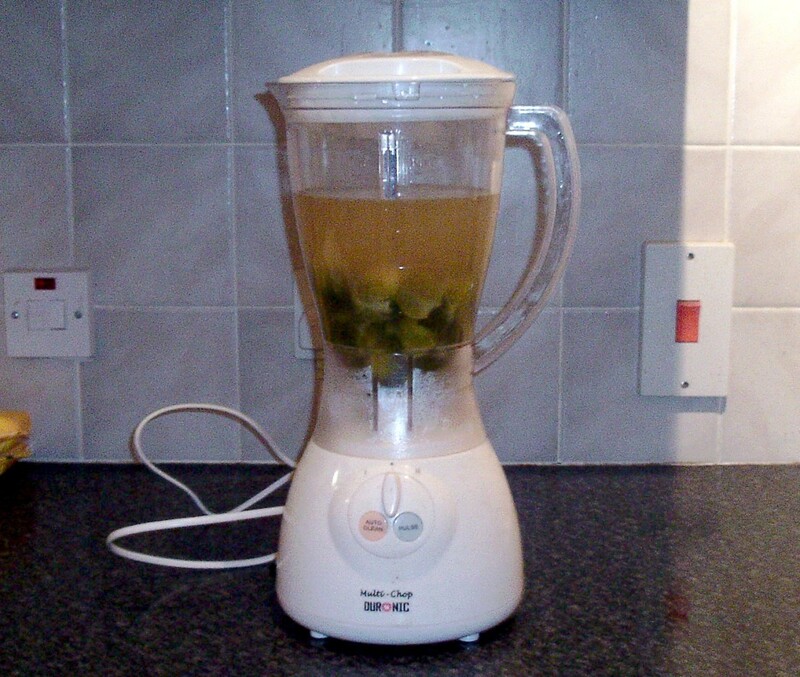 This will remove any small impurities as well as much of the fat. A large ladle is best used to transfer the stock a bit at a time in to the sieve. 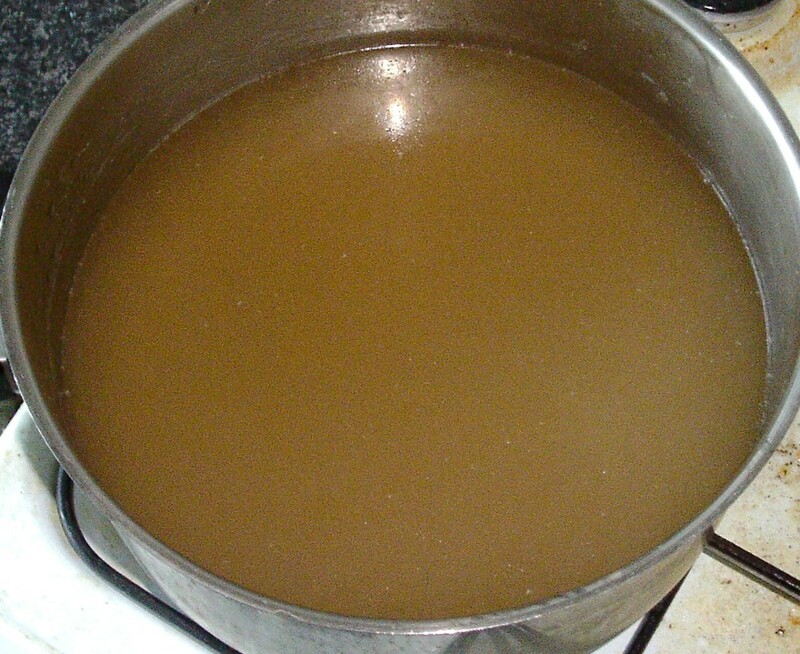 Wash out the pot and return to it the strained stock. 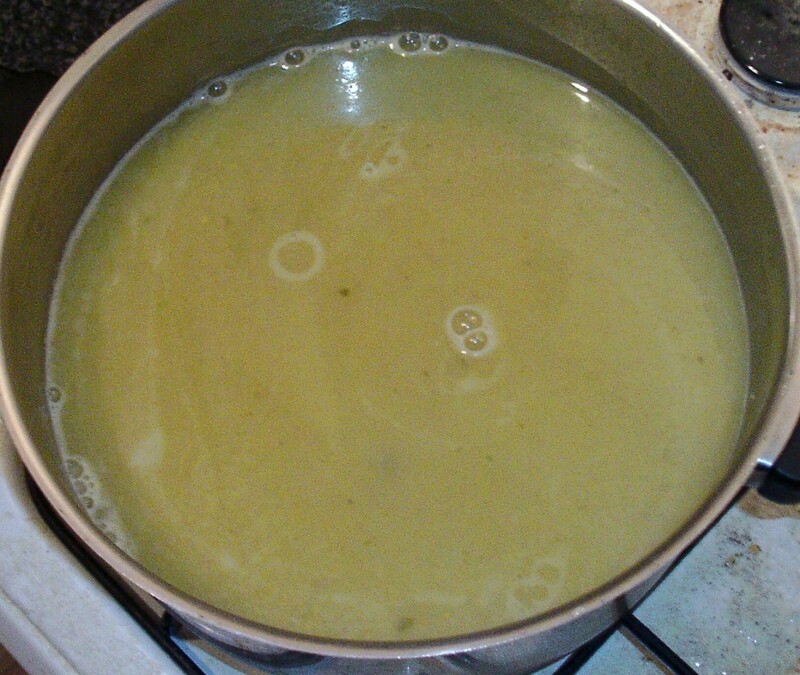 Put the pot on a high heat until the stock reaches a simmer. 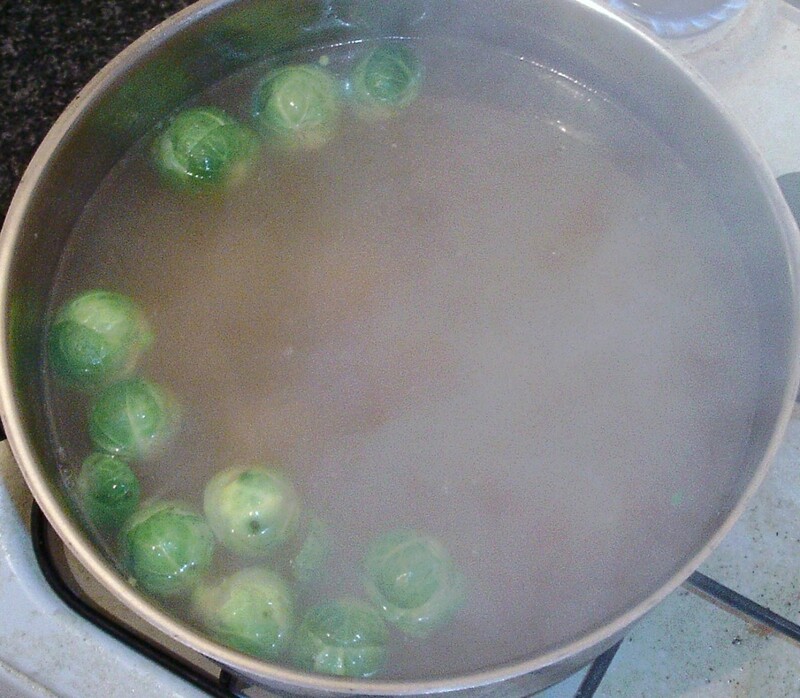 Wash the sprouts before adding them to the pot of hot stock. 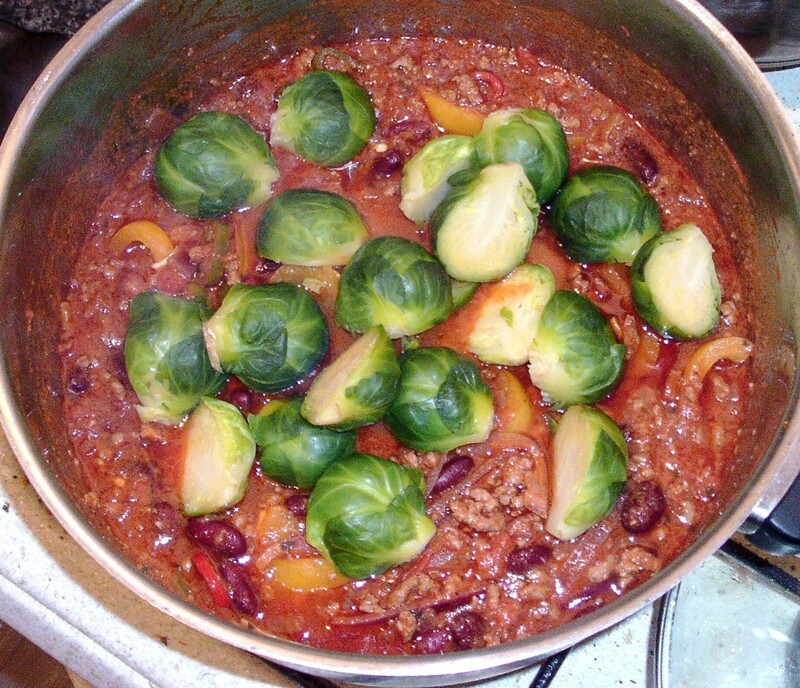 In this particular instance, you do want to cook the sprouts until soft but the nutrients will of course remain in the stock. 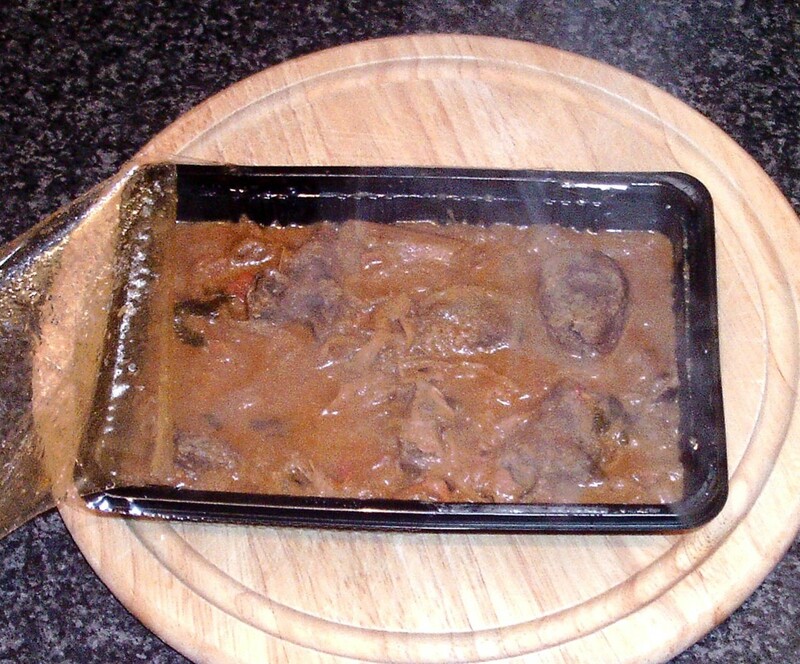 Around ten minutes of simmering should be sufficient. Turn off the heat and allow the contents of the pot to cool for at least half an hour. This is important from a safety perspective, as trying to blend boiling liquids can lead to all sorts of safety issues. 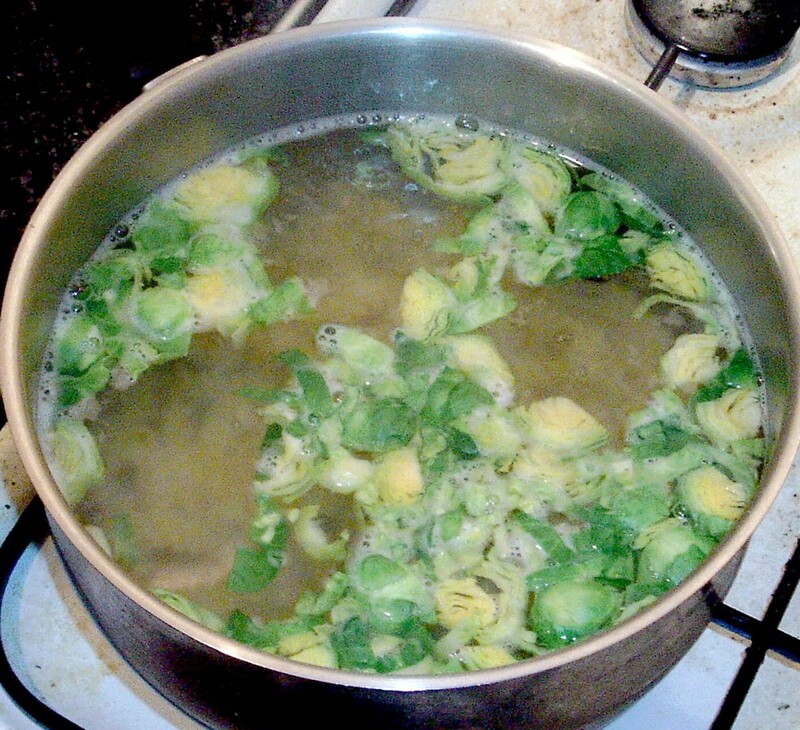 Blend the sprouts and stock in batches, transferring each blended batch to a large bowl before the entire amount can be returned to the soup pot. Put the pot back on to the heat. 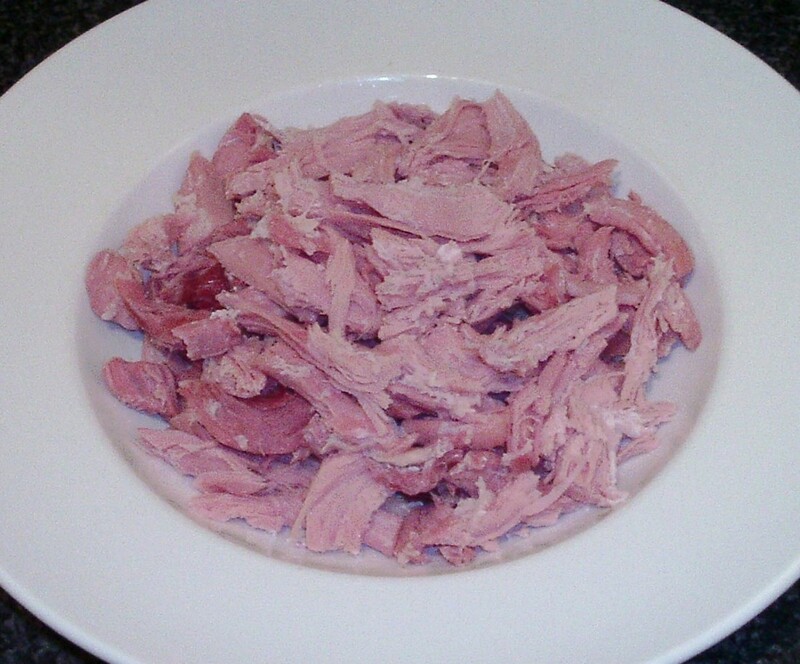 If desired, the ham can be more finely shredded before it is added to the stock with the moderately finely chopped celery leaves. 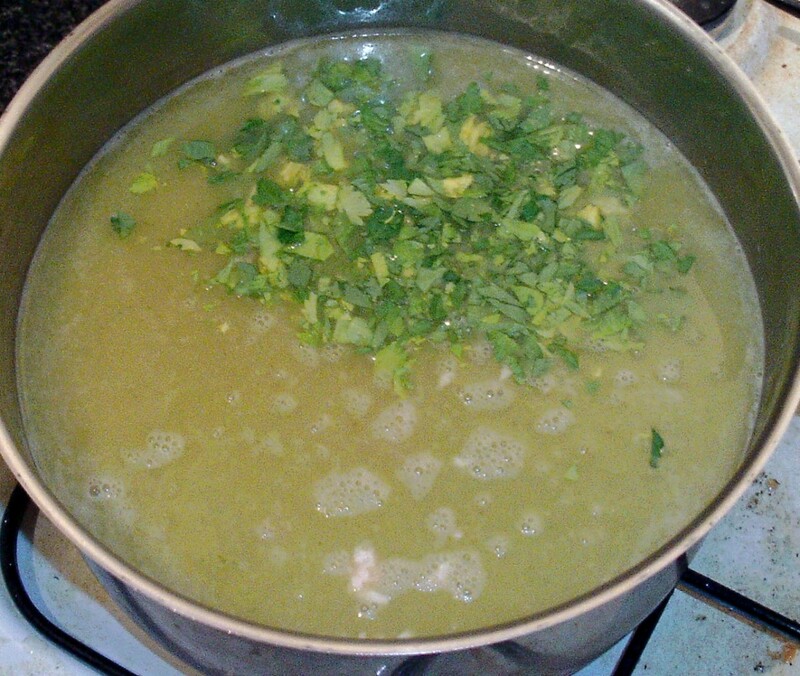 Bring the soup to a simmer for a few minutes just to ensure everything is heated through. 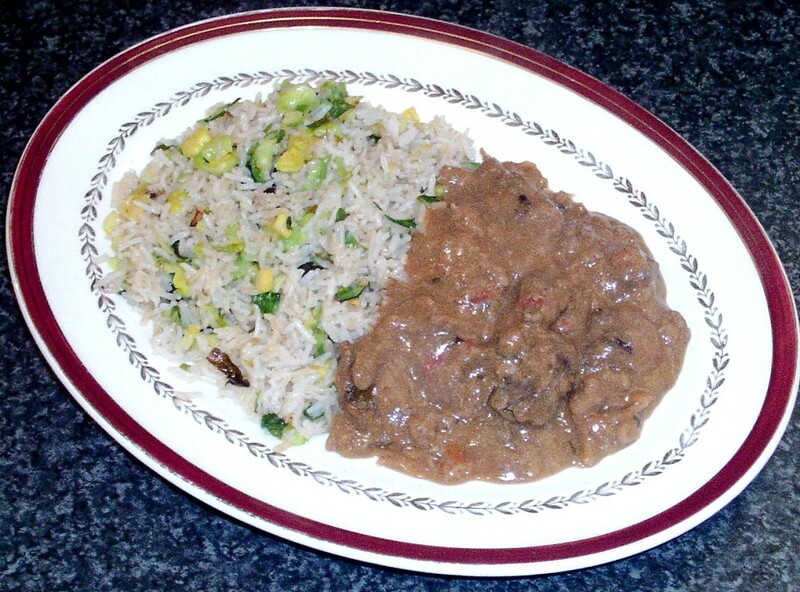 Taste, season as desired with black pepper and it is ready to serve. 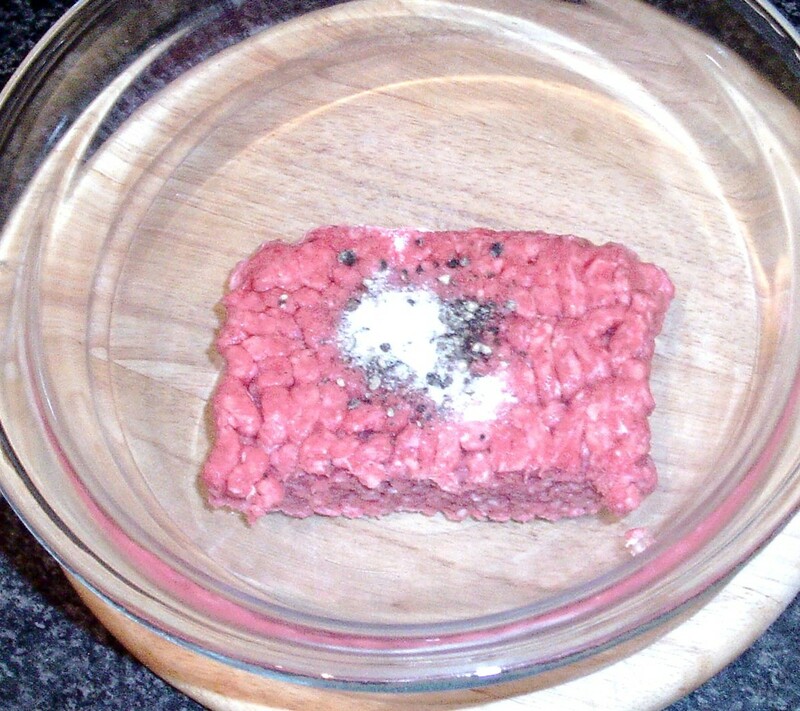 Put the beef in to a mixing bowl and season with salt and pepper. Use your hands to knead the seasoning through the meat. 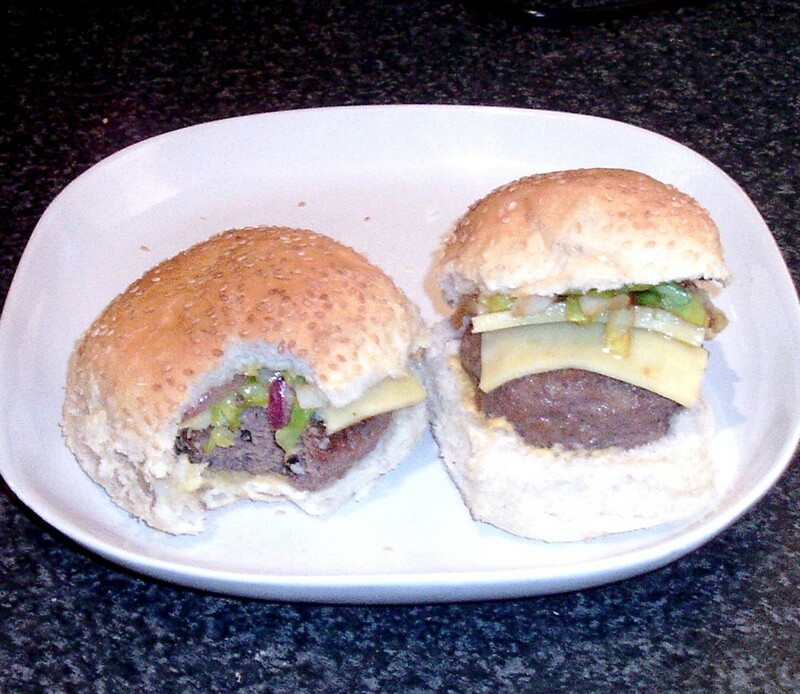 Divide the beef in to two equal portions and roll each portion in turn in to a ball before flattening between your palms in to burger patties approximately three-quarters of an inch thick. 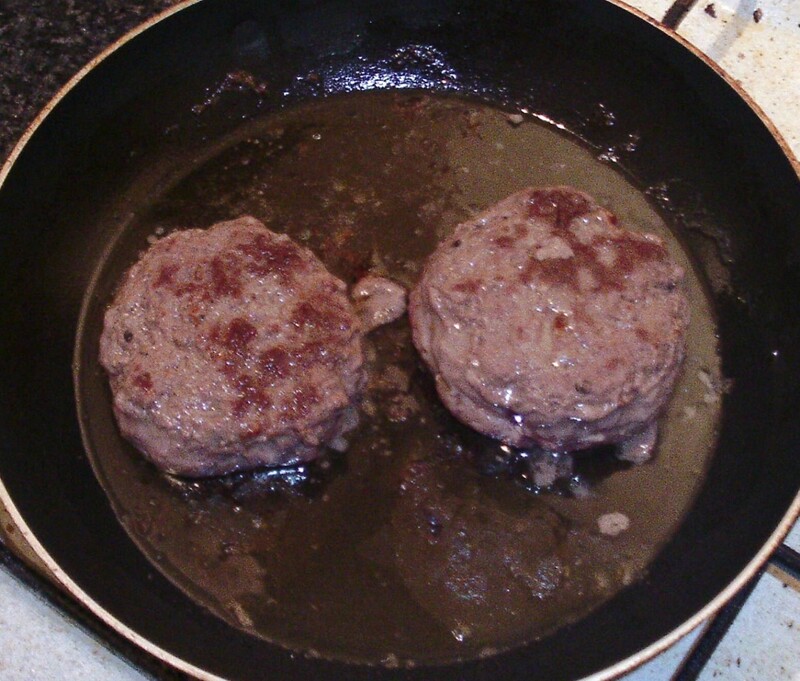 Sit the patties on a plate, cover and leave them to rest for ten minutes or so. 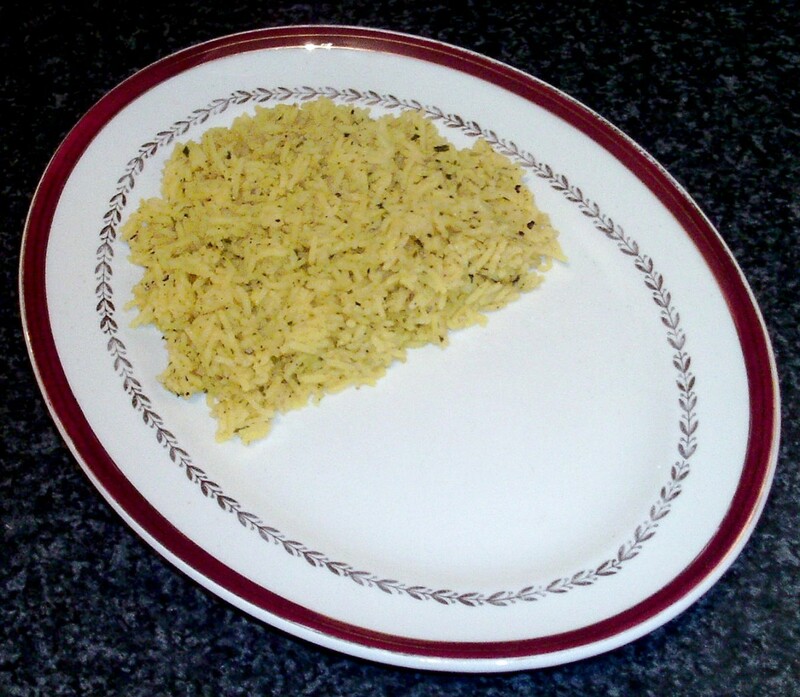 Pour two or three tablespoons of cooking oil in to a non-stick frying pan and bring it up to a medium heat. 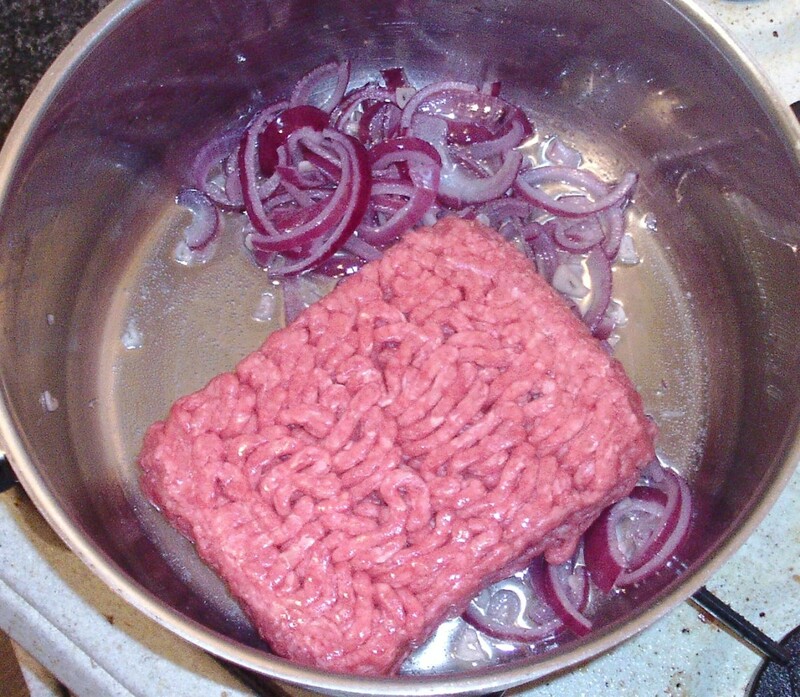 The burgers will take seven to eight minutes each side over a low to medium heat to cook. 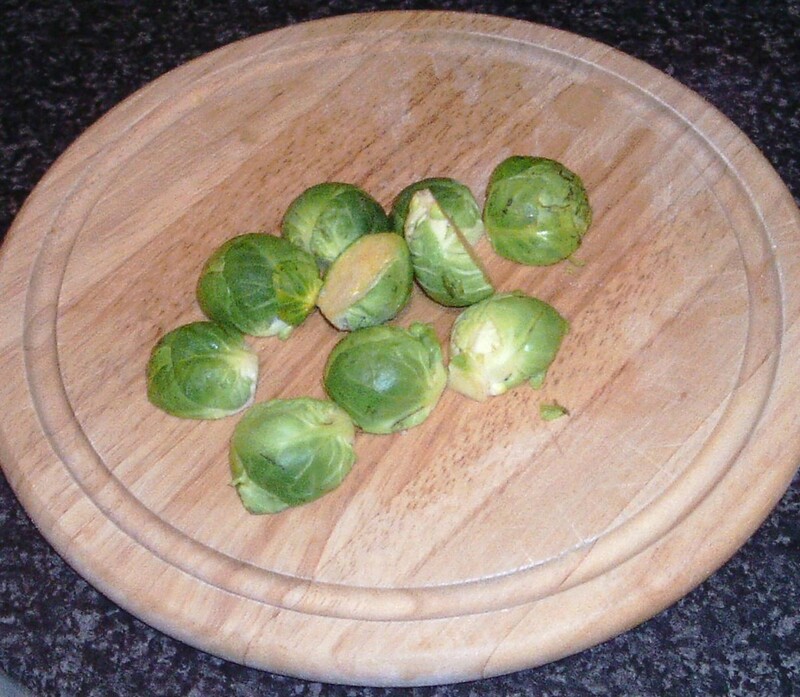 Wash the sprouts, half them through the core and lay each half flat and slice. Slice the peeled onion half and separate in to strands. 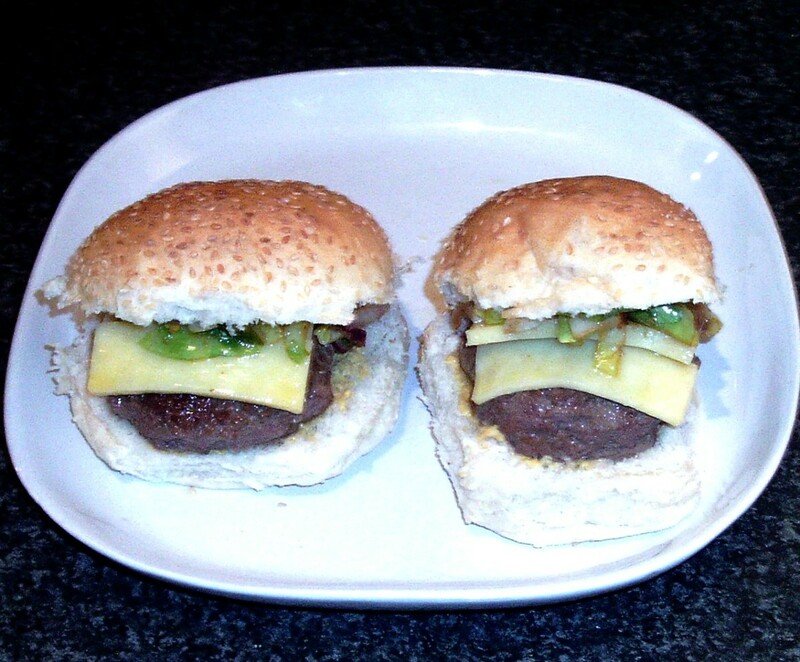 A couple of minutes after the burgers are turned, carefully lay the cheese slices on top and let them slowly melt over the last few minutes of cooking. 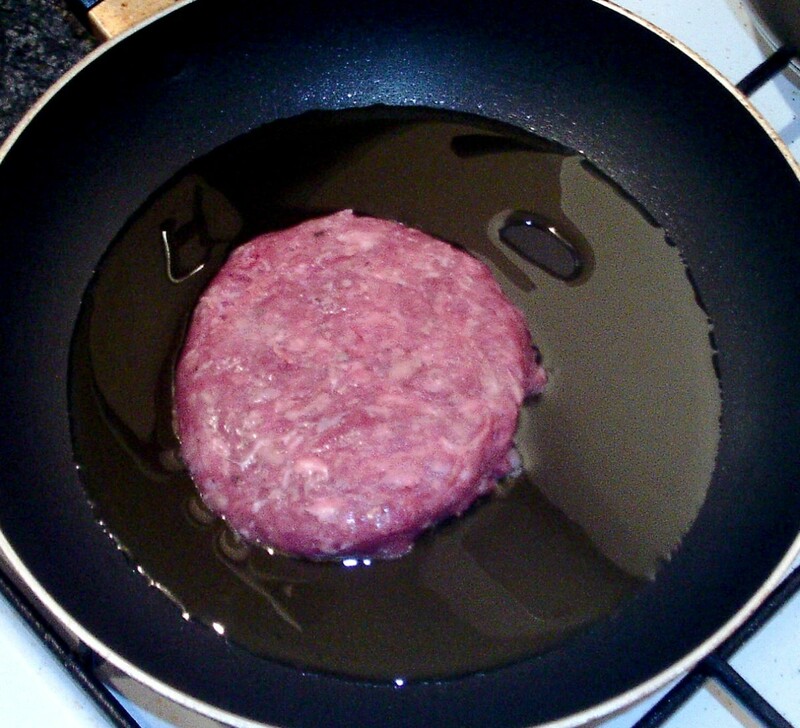 Lift the burgers to a heated plate and cover. 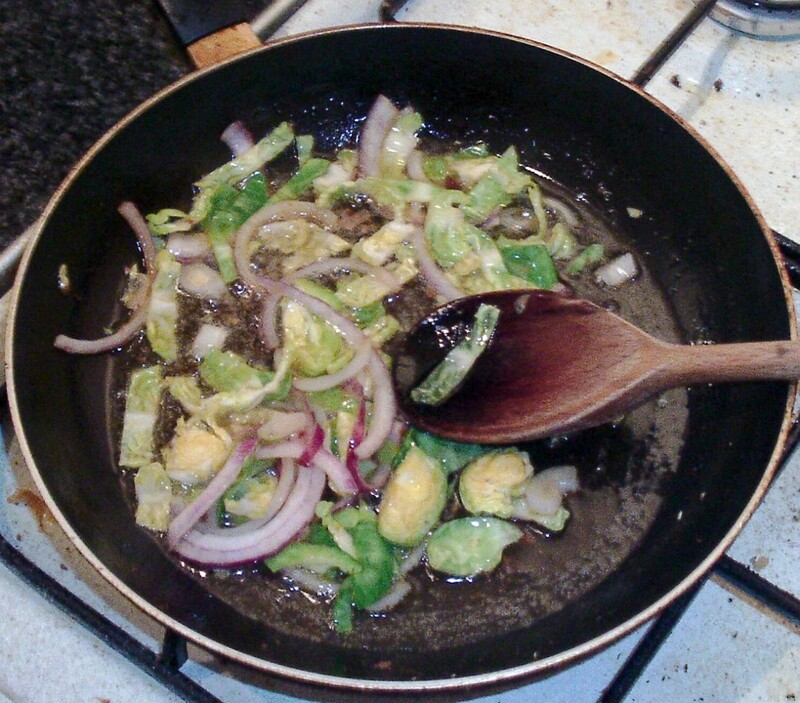 Allow to rest while you fry the sprouts and onion for a couple of minutes in the same pan over a medium to high heat. 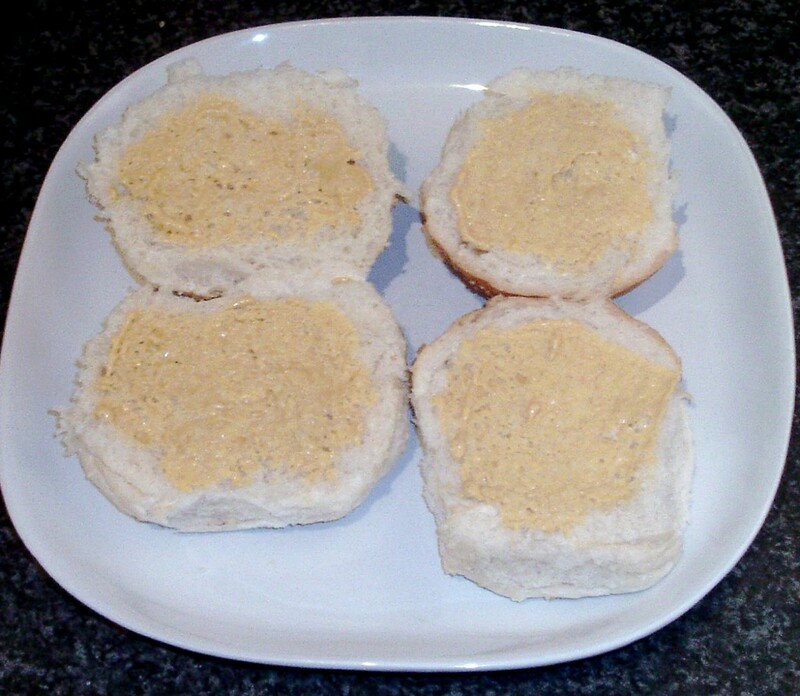 Cut the rolls in half and spread both halves of each with mustard. 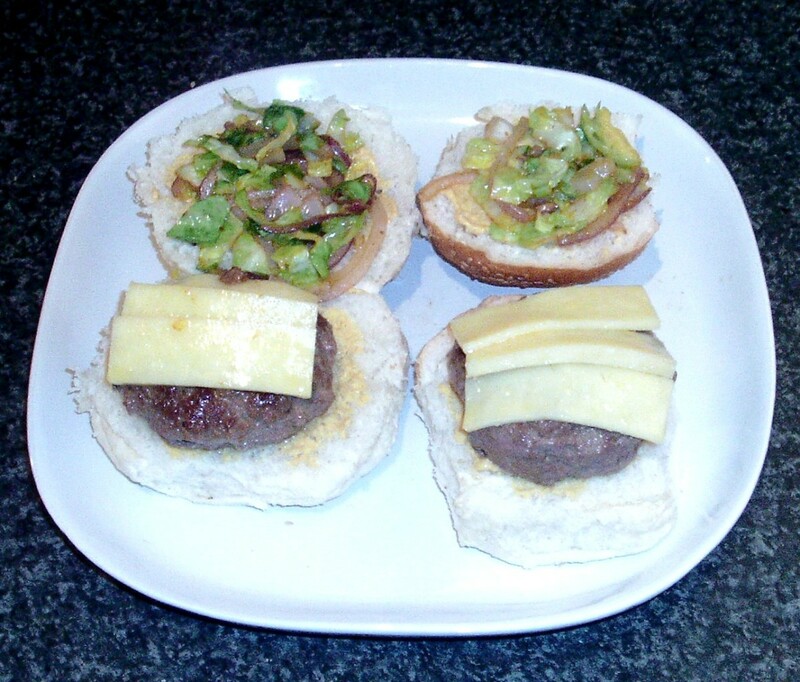 Lay a burger on the bottom half of each roll, top with the sprouts and onion and close over to serve. Put the ox cheek in to a small pot. 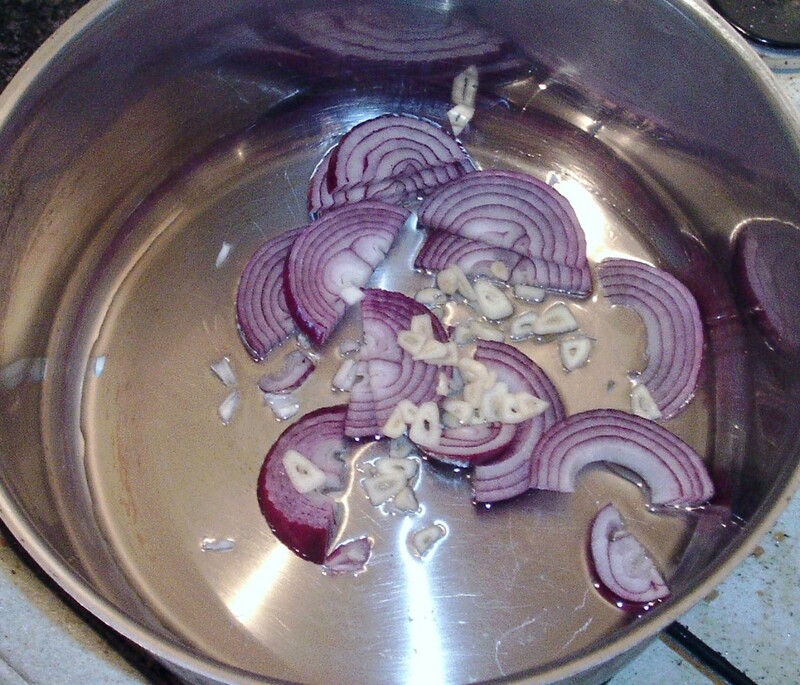 Slice the onion and scatter it over the top along with the peppercorns, some salt and the dried thyme. 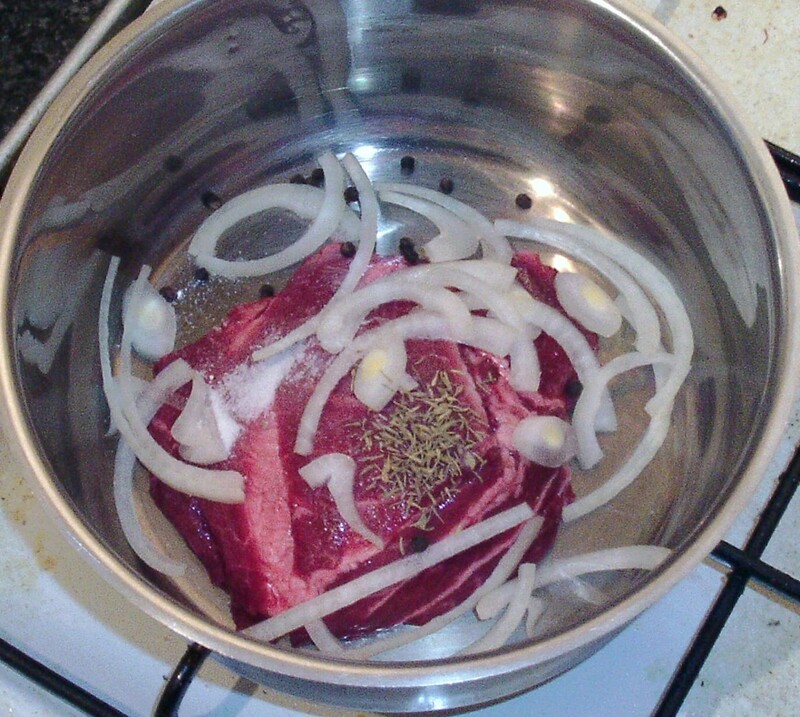 Pour enough beef stock in to the pot to ensure the ox cheek is comfortably covered. Put the pot on a high heat until the stock starts to boil. Adjust the heat to achieve and maintain as gentle a simmer as possible, cover and leave to simmer for two and a half hours. 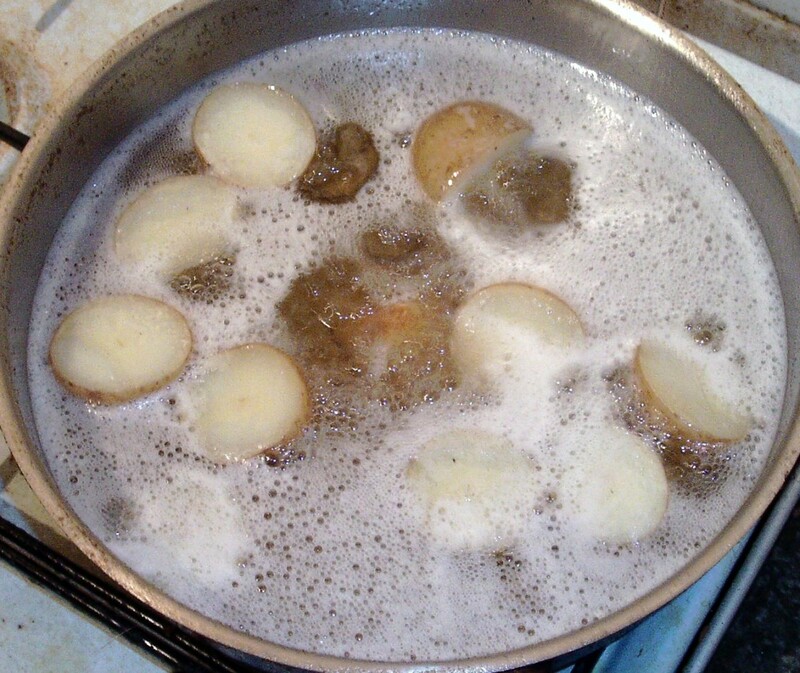 When the ox cheek is simmering, wash the potatoes and cut them in half across the way. Put them in to a large pot of cold, salted water and bring the water to a simmer for twenty-five minutes. 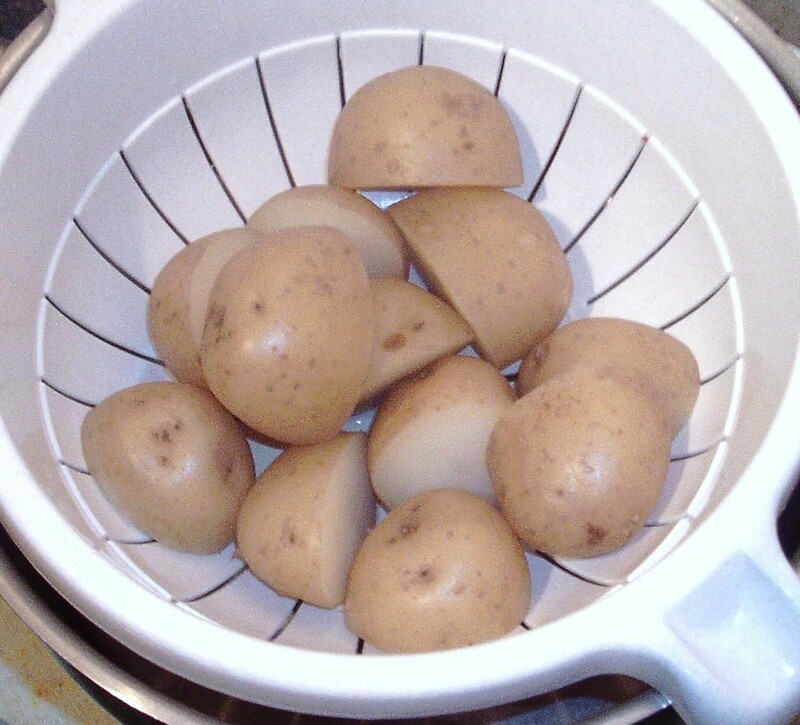 Drain the potatoes, allow to steam off for five minutes, then cover and leave to cool completely. 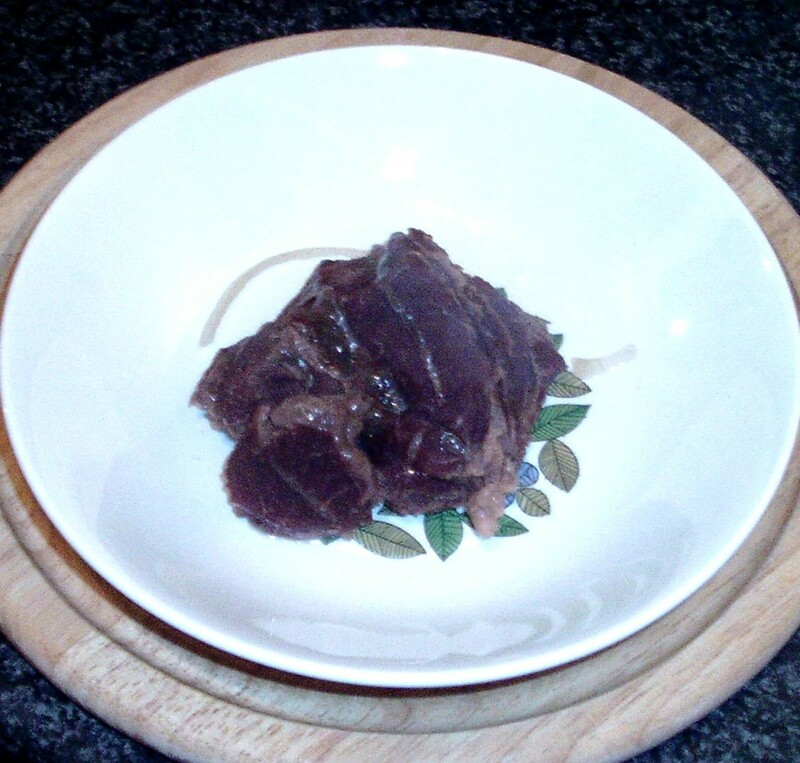 When the ox cheek is ready, lift iot from the stock with a slotted spoon to a warmed plate and cover with tinfoil to let it rest. 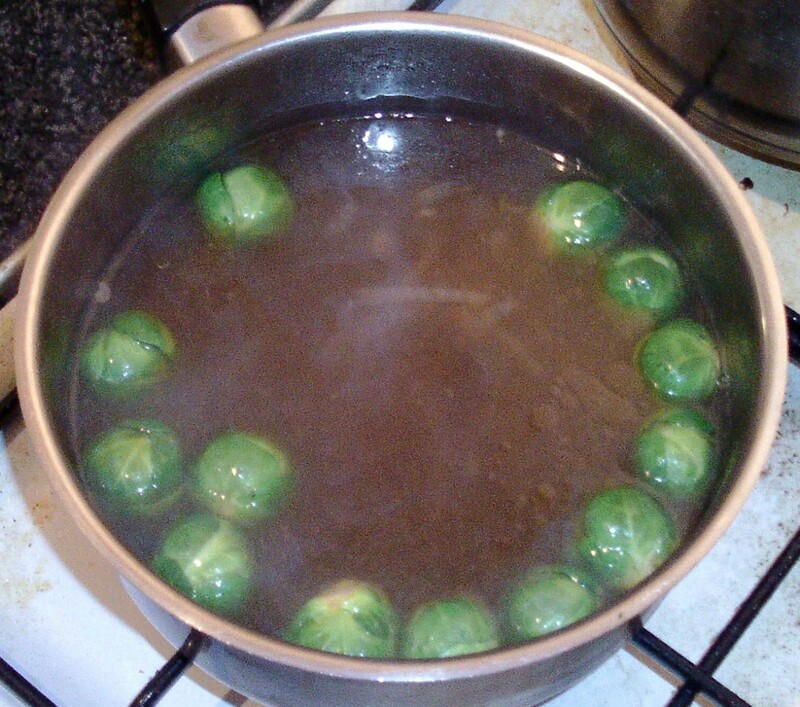 Add the sprouts to the hot stock and simmer for five minutes. 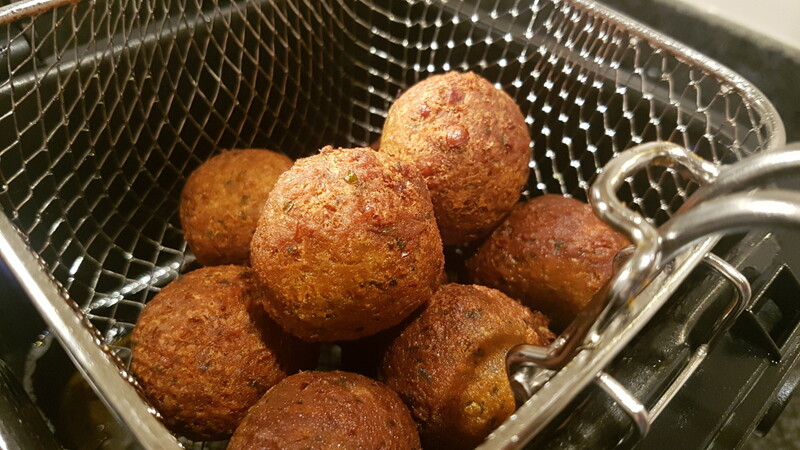 The potatoes should be deep fried in hot oil for five minutes or until crisp and golden. 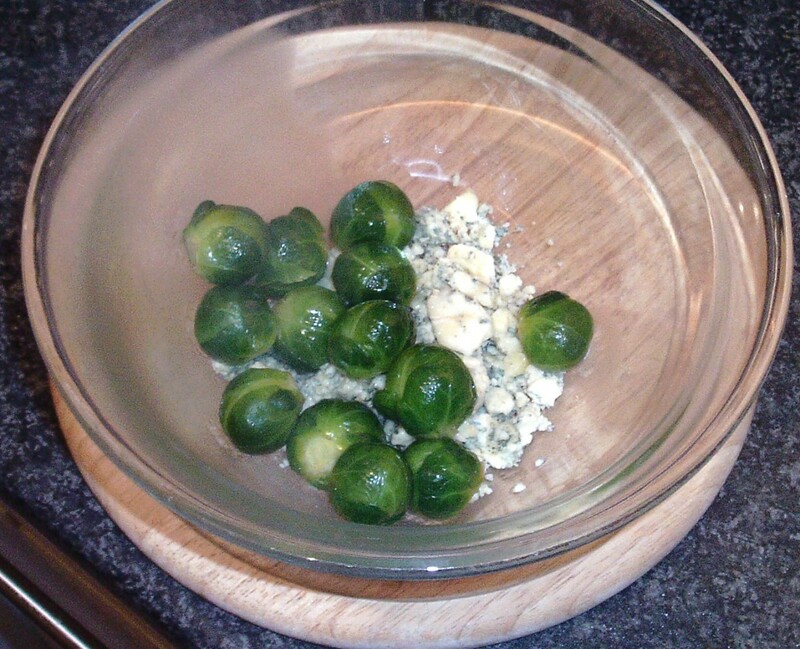 Crumble the blue cheese in to a large bowl and when the sprouts are ready, lift them from the stock with a slotted spoon to the bowl. 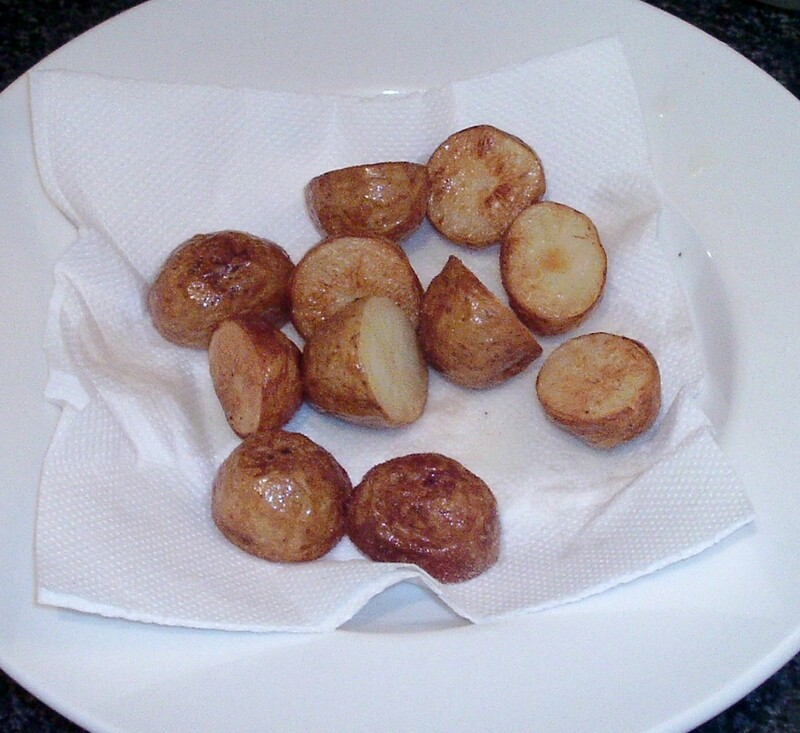 Drain the potatoes on a plate covered with kitchen paper and season with salt and malt vinegar. 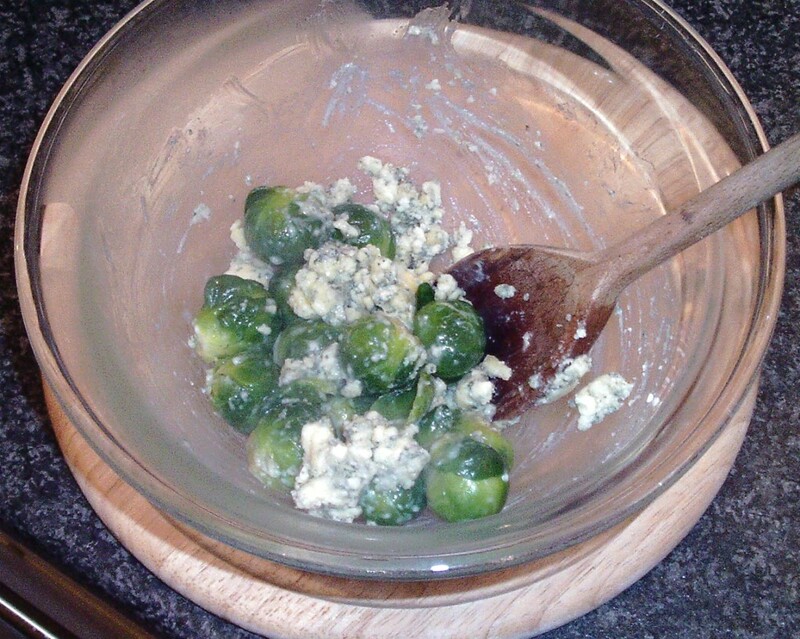 Turn the sprouts around carefully in the blue cheese with a wooden spoon until the cheese is gooey and coats all the sprouts. Plate up the various meal components for service. 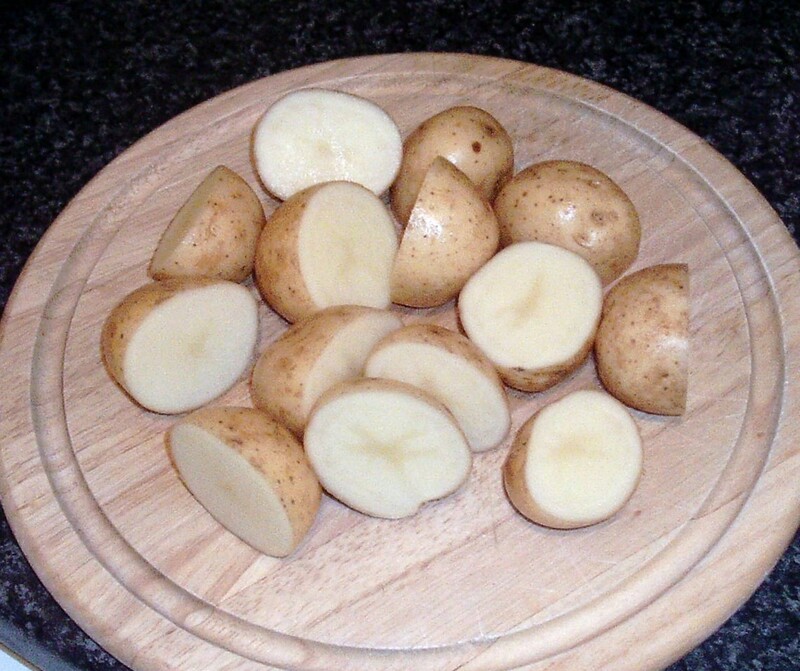 Wash the potato, cut it in half lengthways and cut each half in to three or four wedges. Put the wedges in to a pot of cold, salted water and bring the water to a simmer for ten minutes. 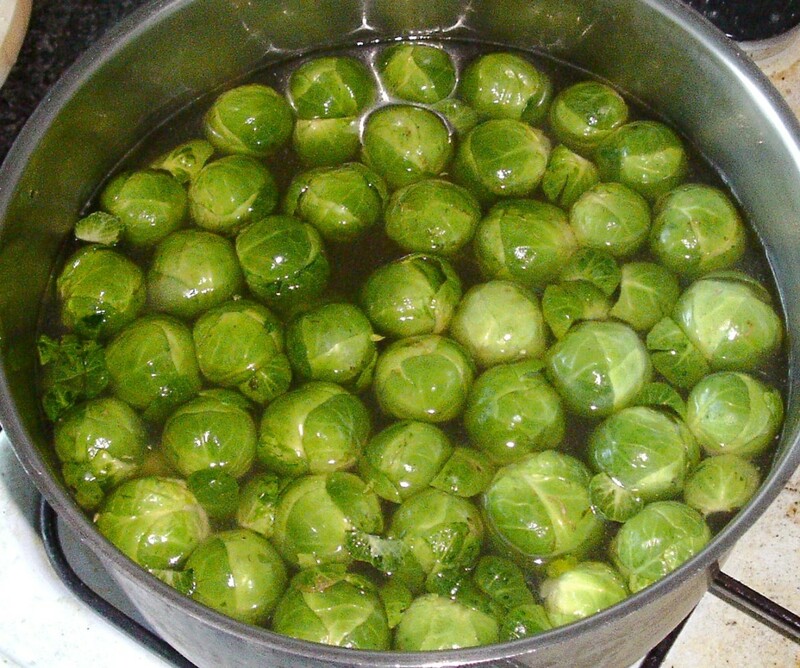 Put the sprouts in to a separate pot of boiling salted water and simmer for five minutes before draining and setting aside to cool. Drain the wedges and set aside briefly to cool while your oven preheats to 400F/200C/Gas Mark 6. When the oven is heated, pour a couple of tablespoons of vegetable oil in to a large glass or stone bowl and season with salt and pepper. Carefully turn the wedges around in the oil with a wooden spoon before laying them on a roasting tray and cooking in the oven for twenty minutes, turning half way through with tongs. 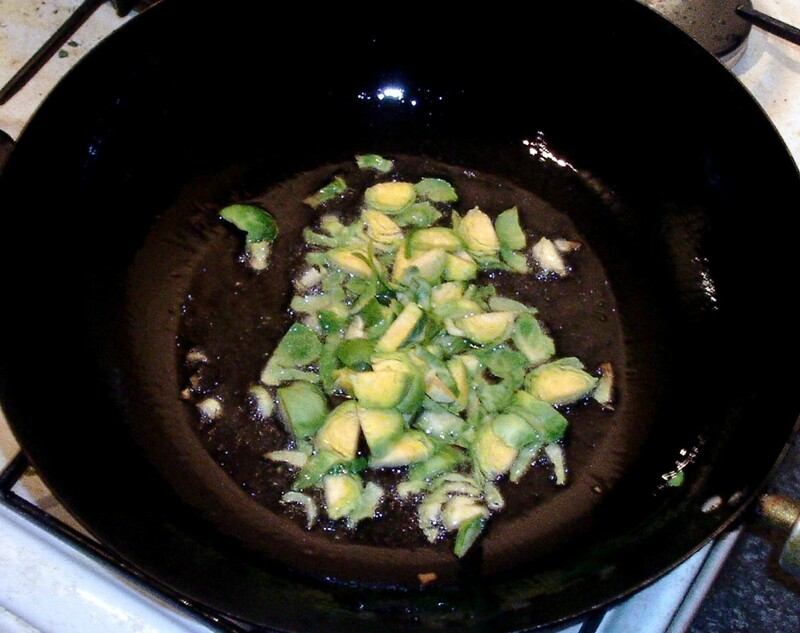 Pour a little oil in to a non-stick frying pan and bring it up to a medium heat. 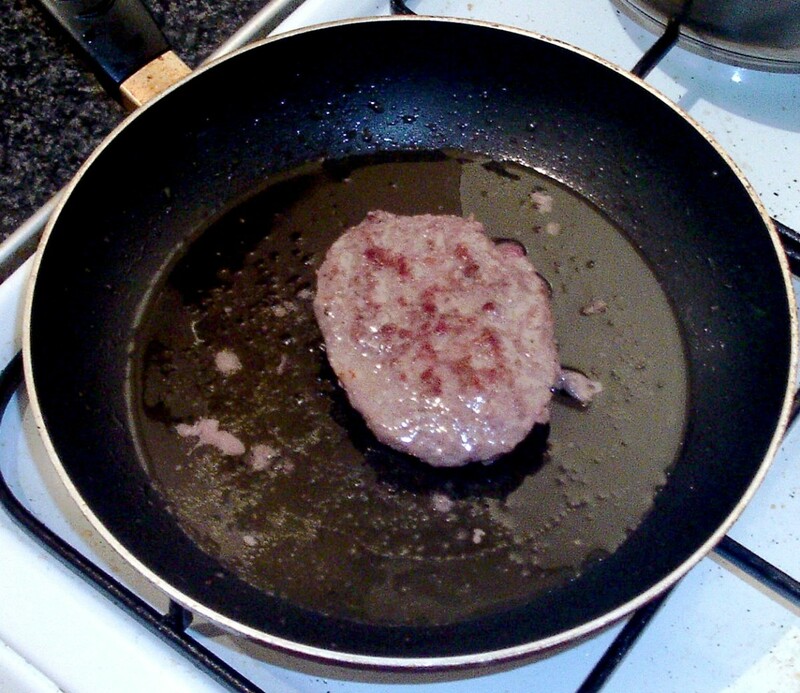 Fry the burger for seven or eight minutes each side. 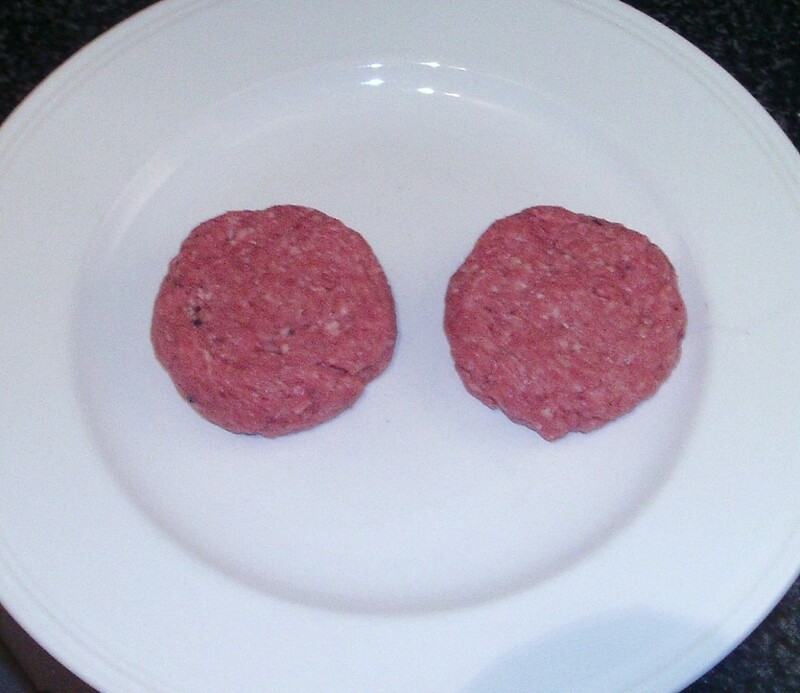 As soon as the burger is on to cook, wash the tomatoes and dry with kitchen paper before cutting them in half. 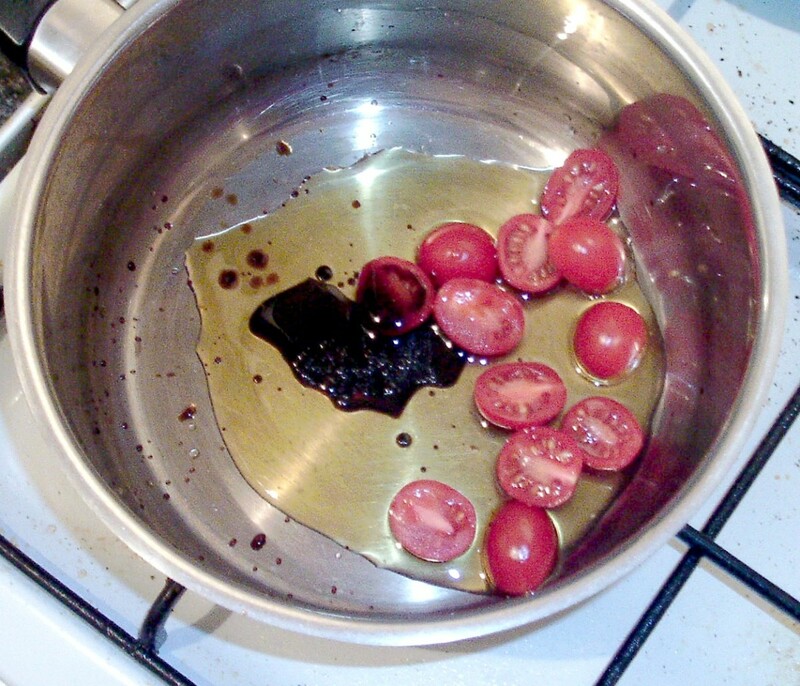 Pour the olive oil in to a small saucepan and add the balsamic vinegar, dried basil and some salt and pepper. Add the tomatoes to the pan and cook over a medium heat, stirring frequently, until the tomatoes have broken down to form a sauce. This should take about as long as the burger takes to cook. When the burger is ready, lift it to a heated plate and cover with tinfoil to rest while the sprouts and bacon are fried in the same pan. 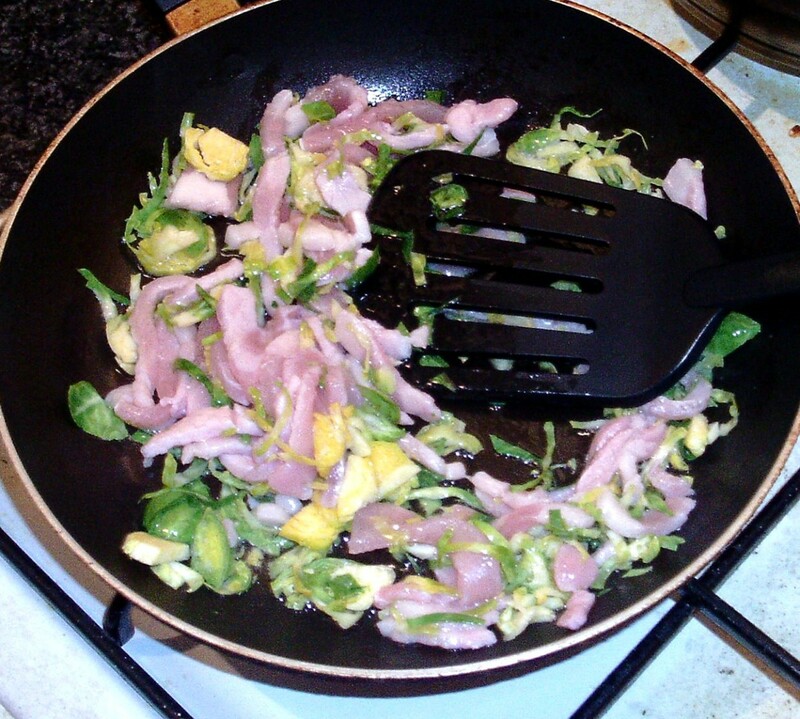 Cut the sprouts in half down through the core and roughly chop the bacon. Fry on a medium to high heat for two to three minutes until the bacon is cooked. 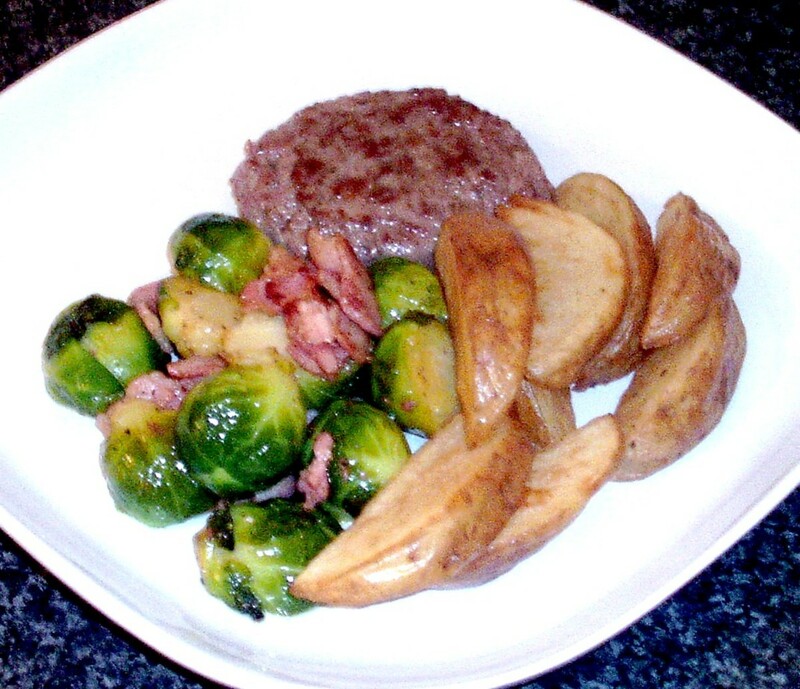 Briefly drain the wedges on a plate covered with kitchen paper before plating with the burger, sprouts and bacon. Spoon the tomato chutney on to the burger last of all. There are occasions in the lives of most families where time simply does not permit the cooking of a meal from scratch on a particular evening. 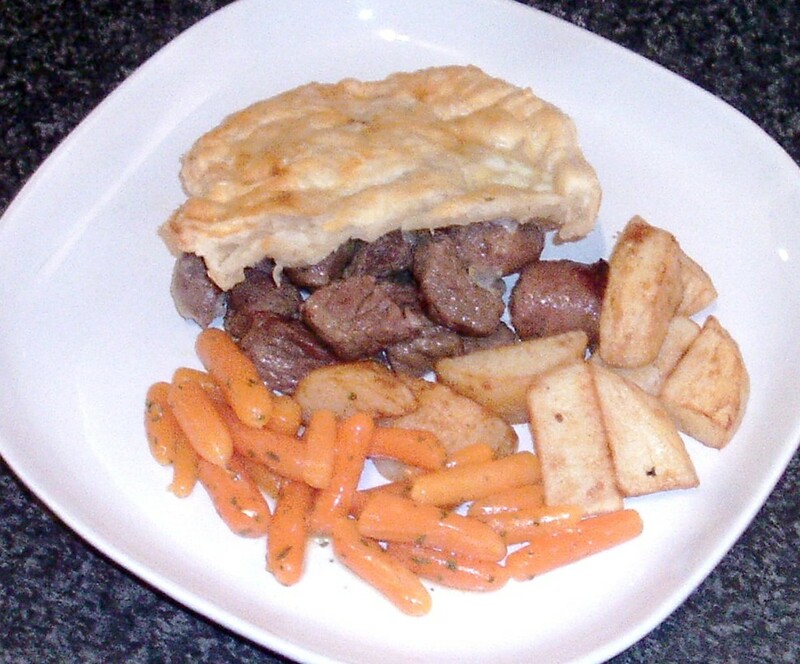 On such occasions, frozen and microwaveable ready meals may necessitate being the order of the day. 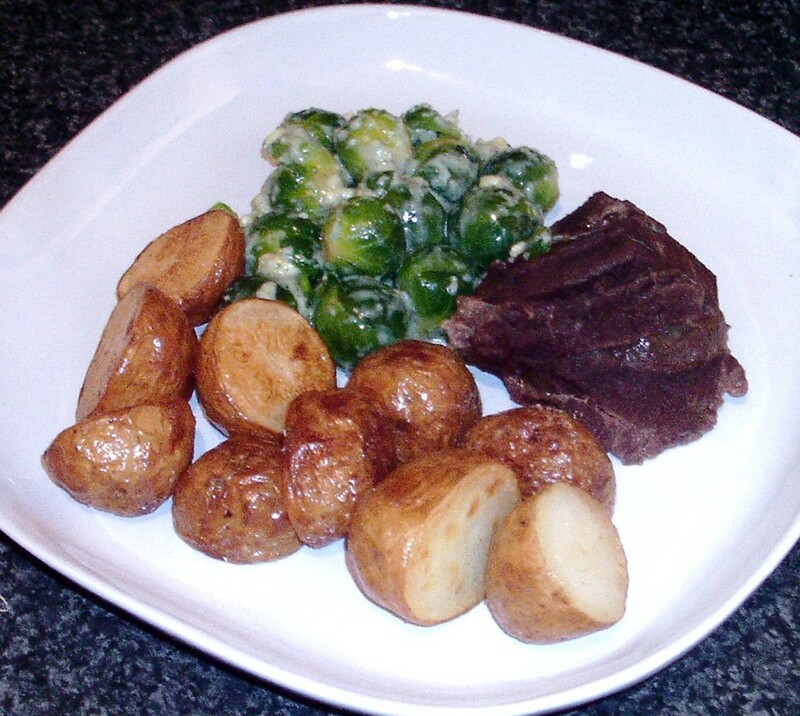 Just because these meals are being served, however, it does not mean sprouts can not be incorporated. 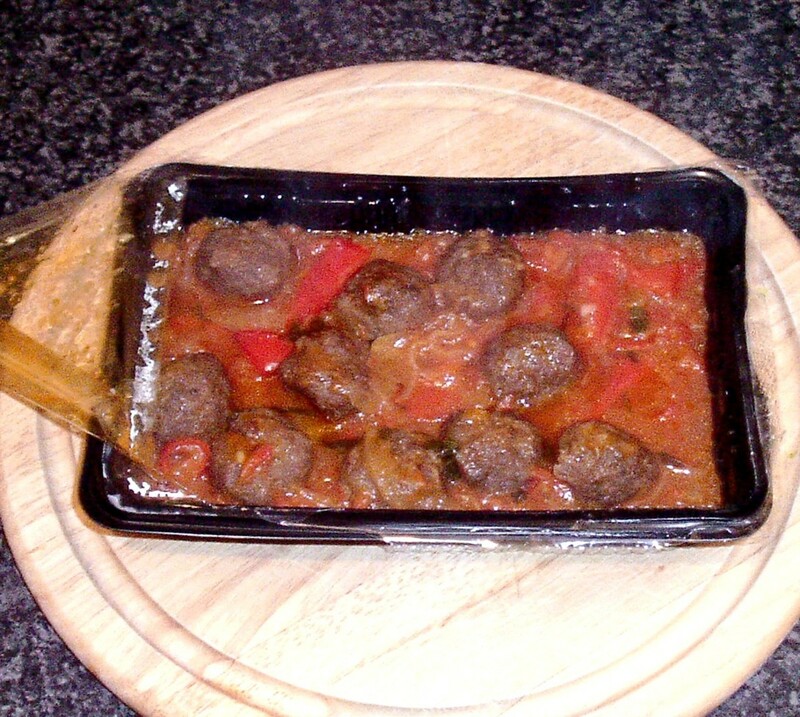 While the two examples featured below may contain fairly exotic combinations, they are essentially meatballs in sauce and curry. 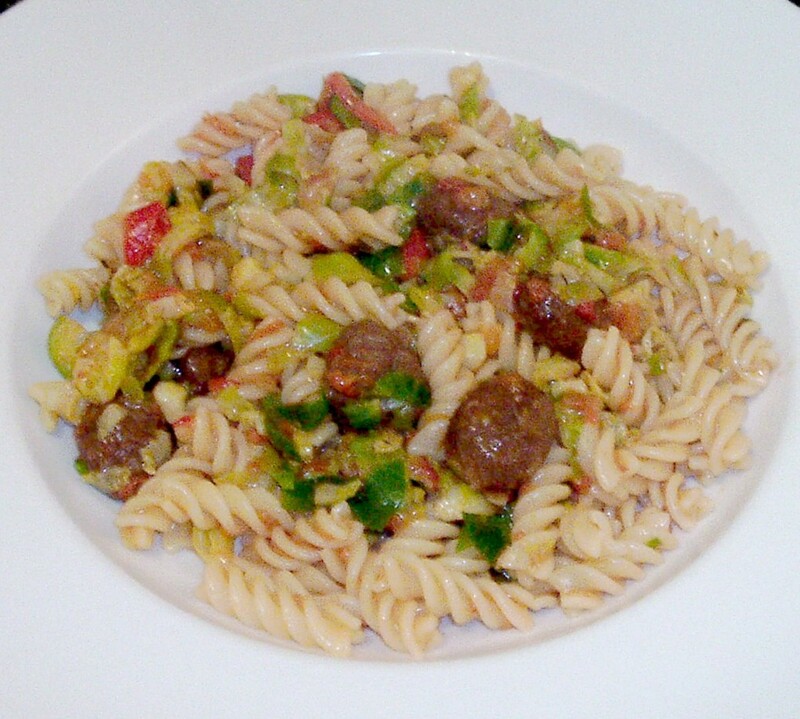 As pasta was being made to accompany the meatballs and rice to accompany the curry, it was easy to include sprouts in these quick to prepare meal elements. 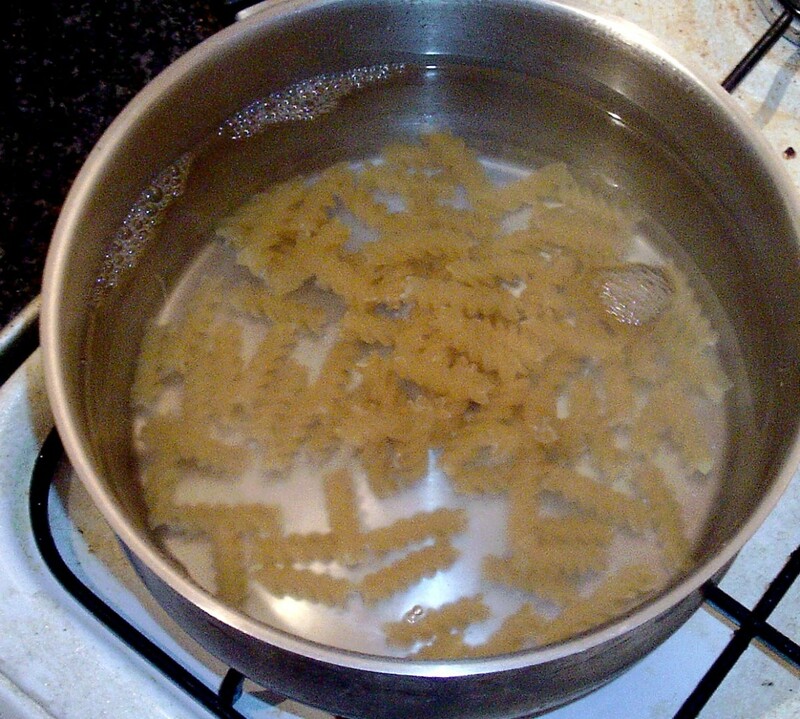 Bring a large pot of salted water to a rolling boil and add the pasta. Stir well and turn the heat down to achieve a gentle simmer for ten minutes. 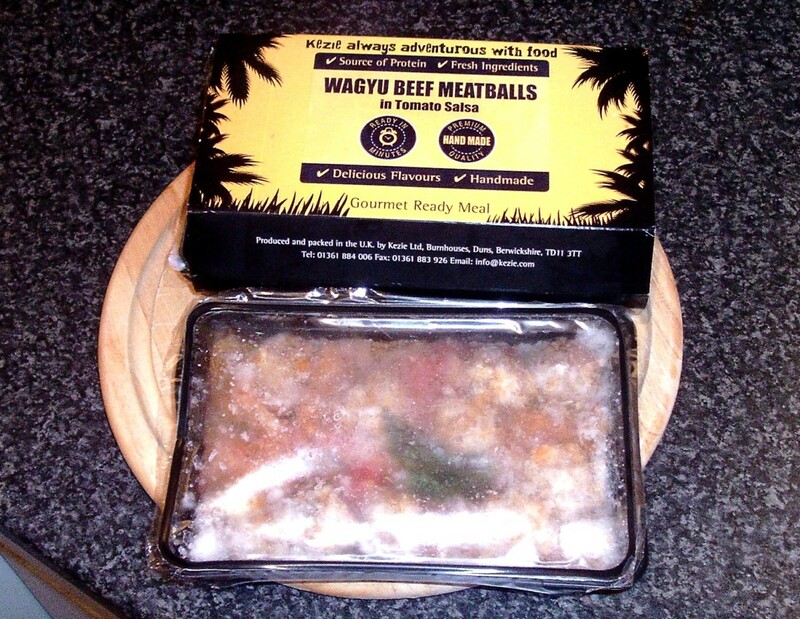 The wagyu meatballs required two blasts of four minutes in the microwave and a couple of minutes' resting time so they are started as soon as the pasta is in the water. 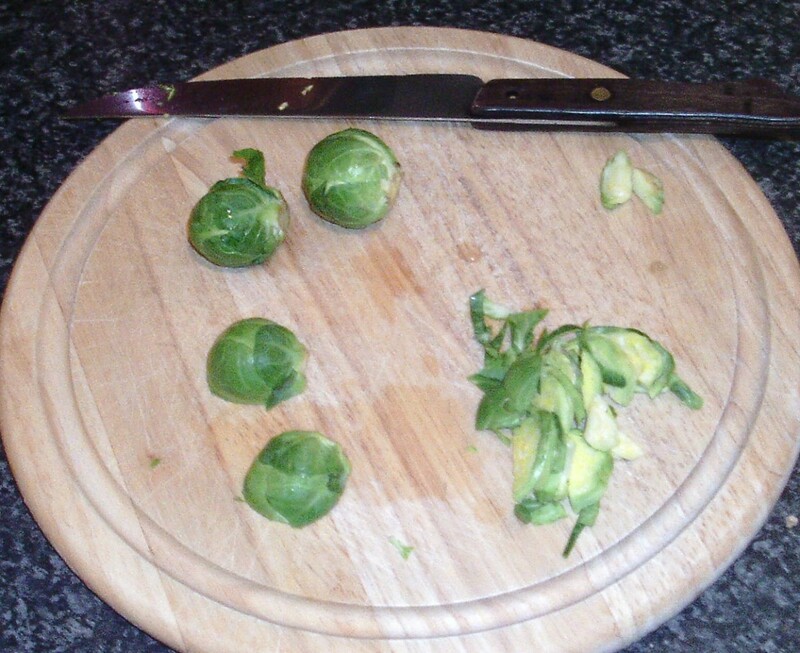 Wash the sprouts, trim off the ends, half through the core and slice thinly across the way. 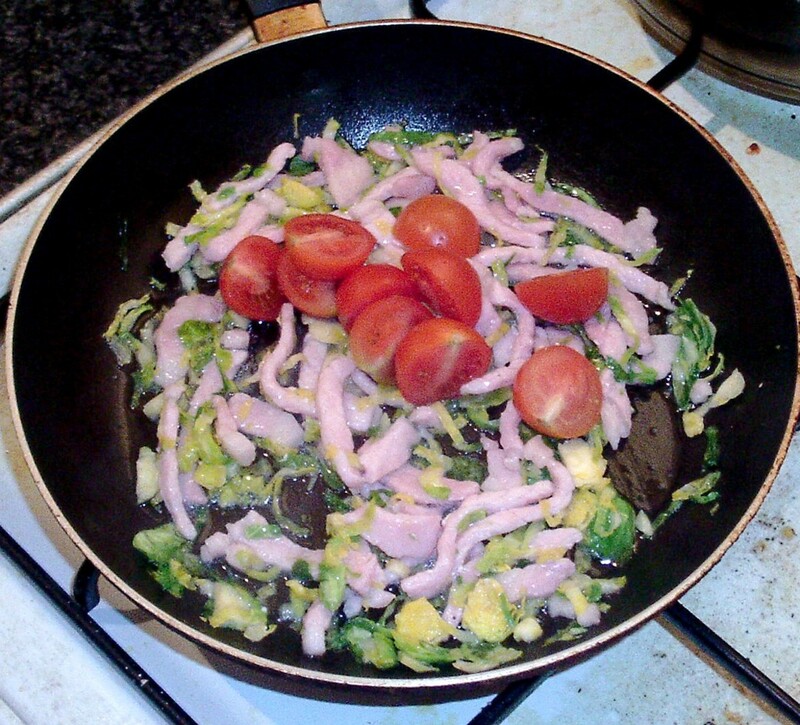 Add the shredded sprouts to the pasta for the last three minutes of cooking time. 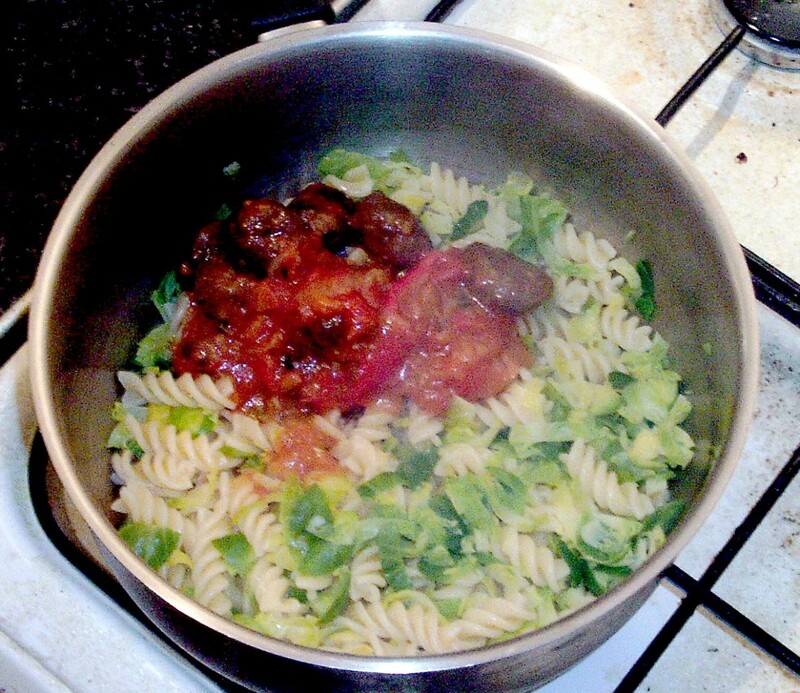 Drain the pasta and sprouts and allow to steam off for a couple of minutes before returning to the pot and pouring in the rested meatballs in salsa. 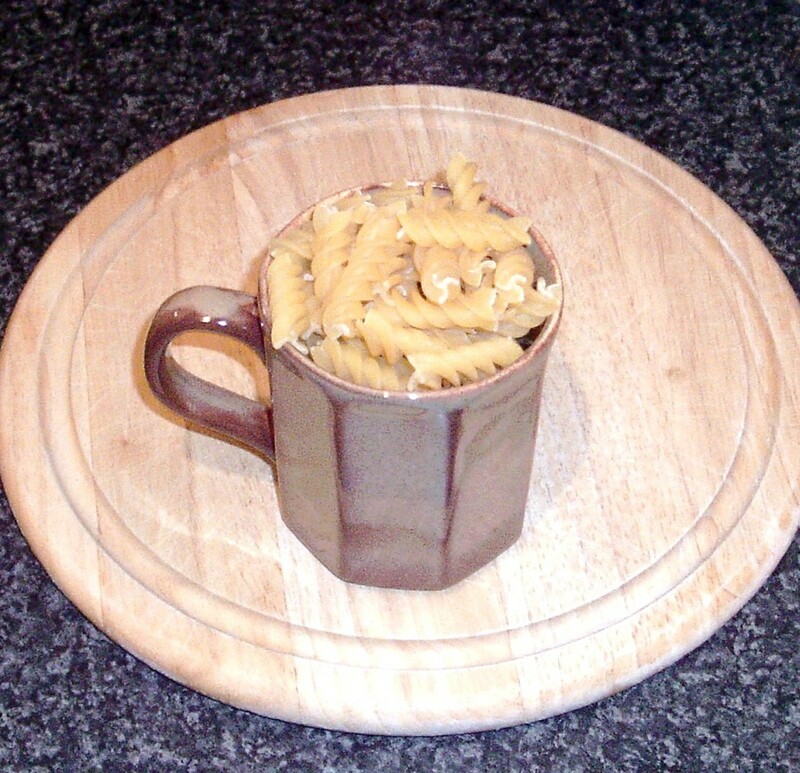 Stir carefully but well with a wooden spoon before plating. Bring a large pot of salted water to a rolling boil. 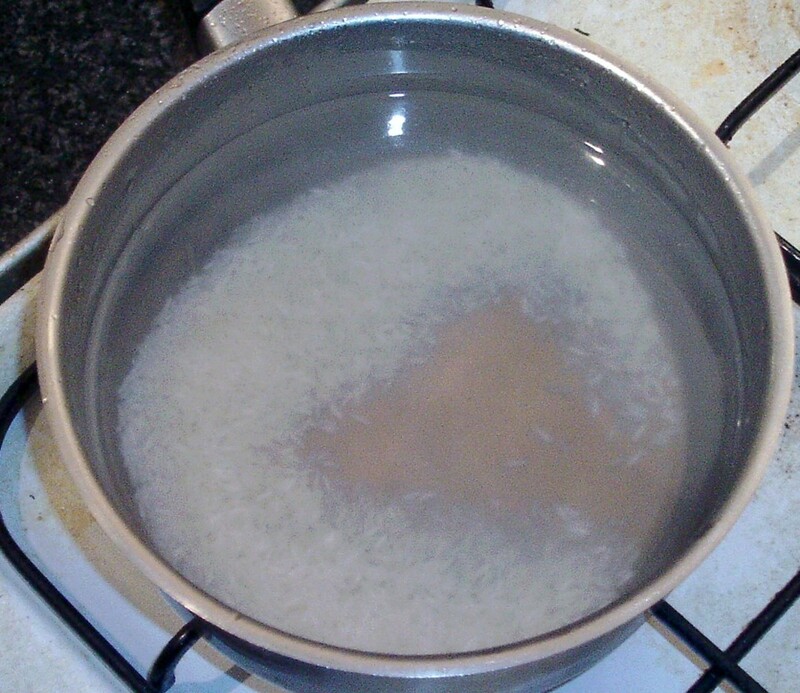 Add the rice, stir well and reduce the heat to achieve a simmer which should be maintained for ten minutes. 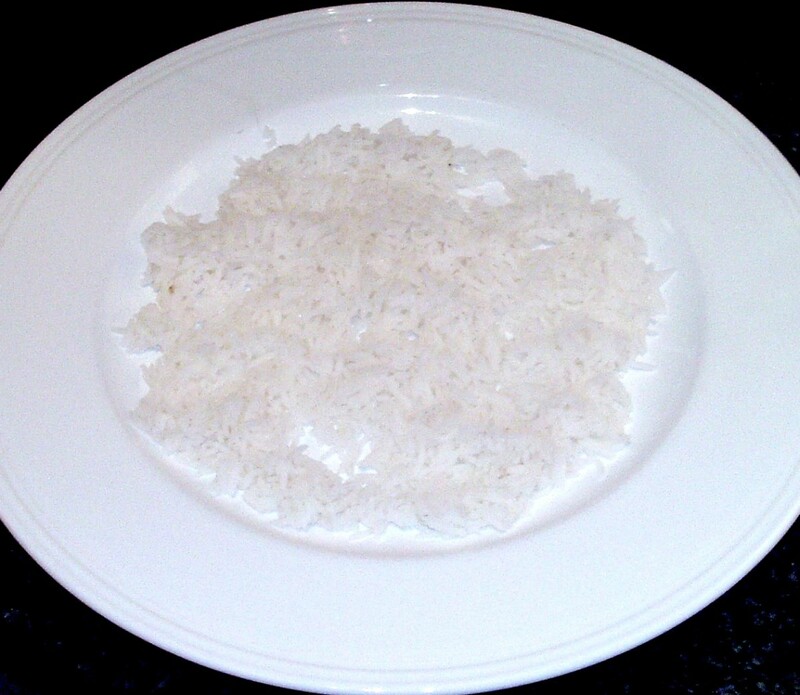 Drain the rice and spread it out on a large plate that it cools quickly. 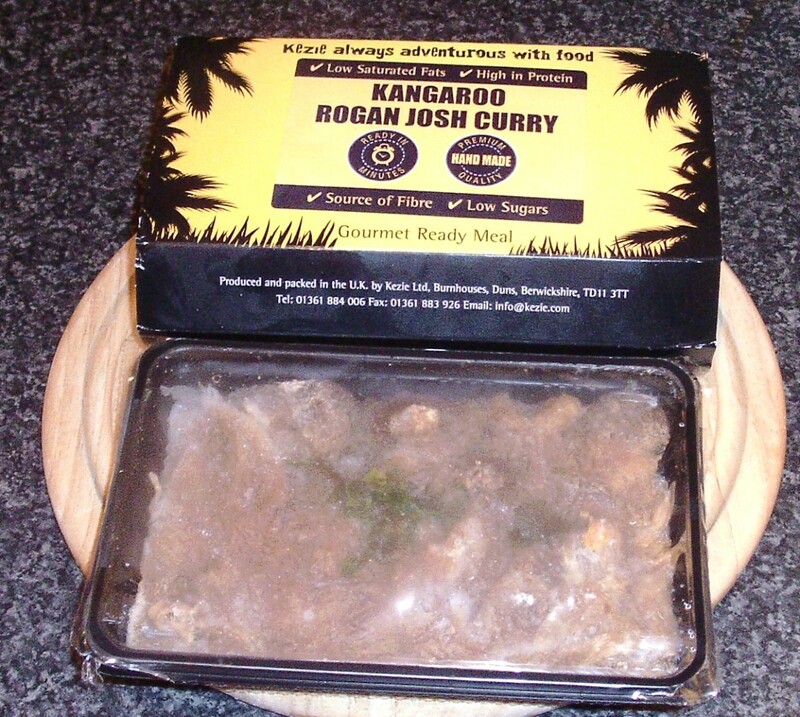 The kangaroo rogan josh required two blasts of four minutes apiece in the microwave plus a couple of minutes' resting time. 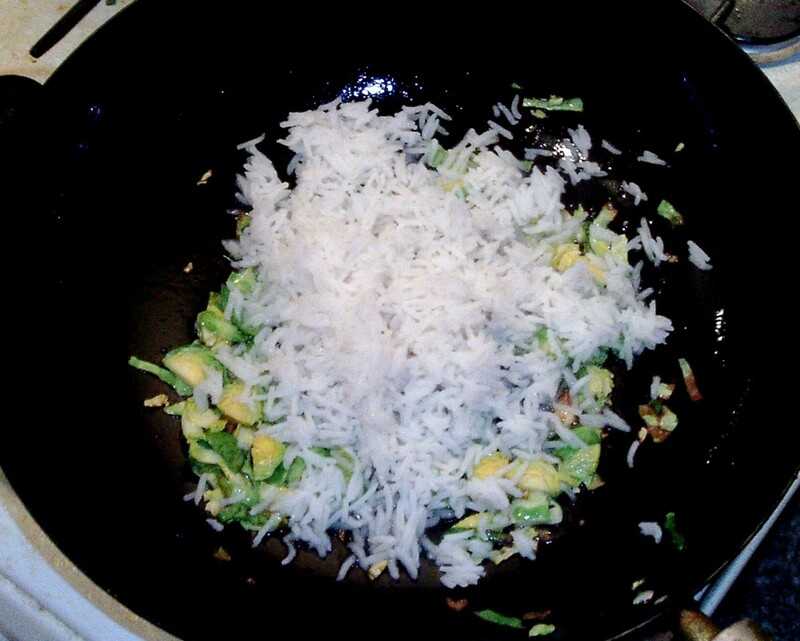 While it is cooking, wash, trim, half and shred the sprouts as in the previous recipe. When the rogan josh is cooked, bring your wok up to a high heat. 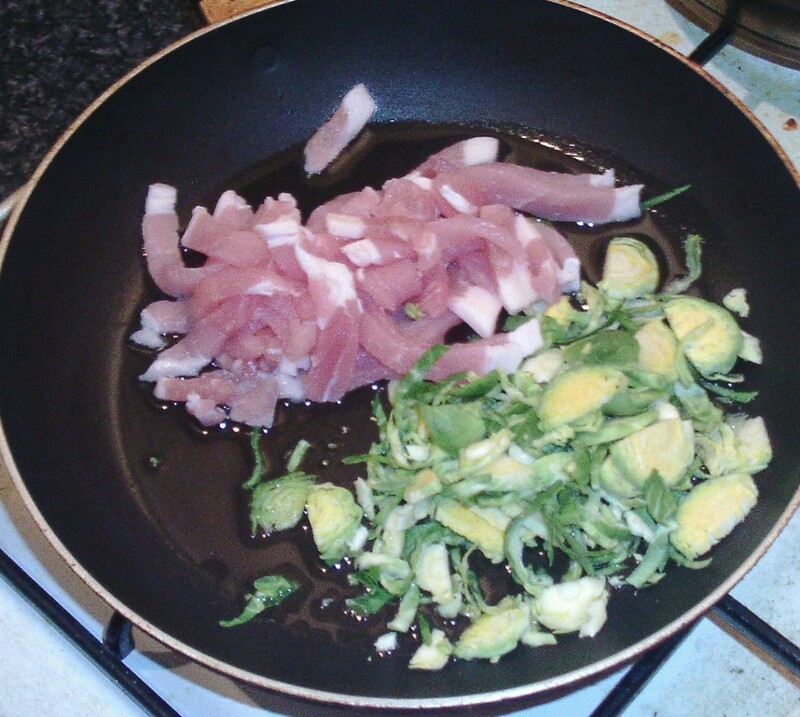 Add a couple of tablespoons of vegetable oil and stir fry the shredded sprouts for one minute. 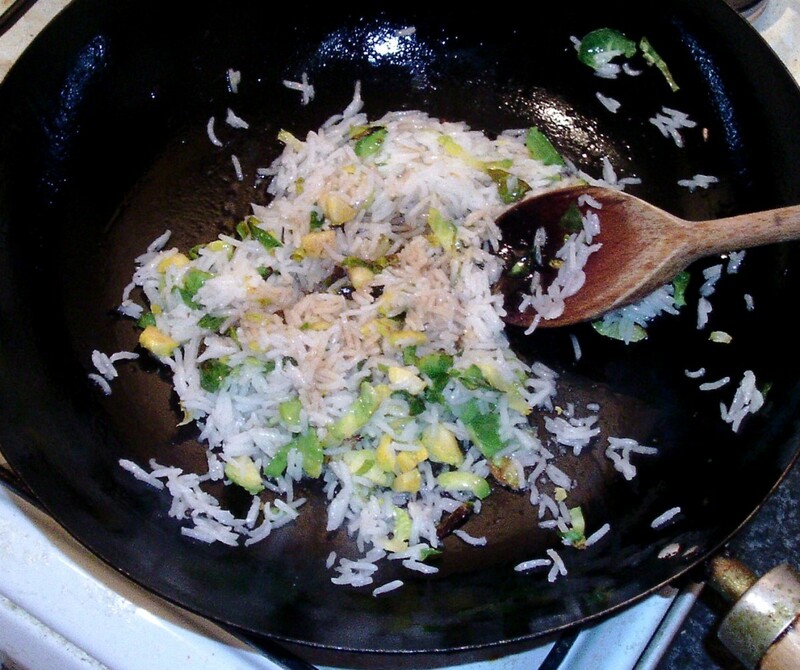 Add the rice to the wok and stir fry for another minute or so before adding a good splash of light soy sauce for a final thirty seconds of stir frying. 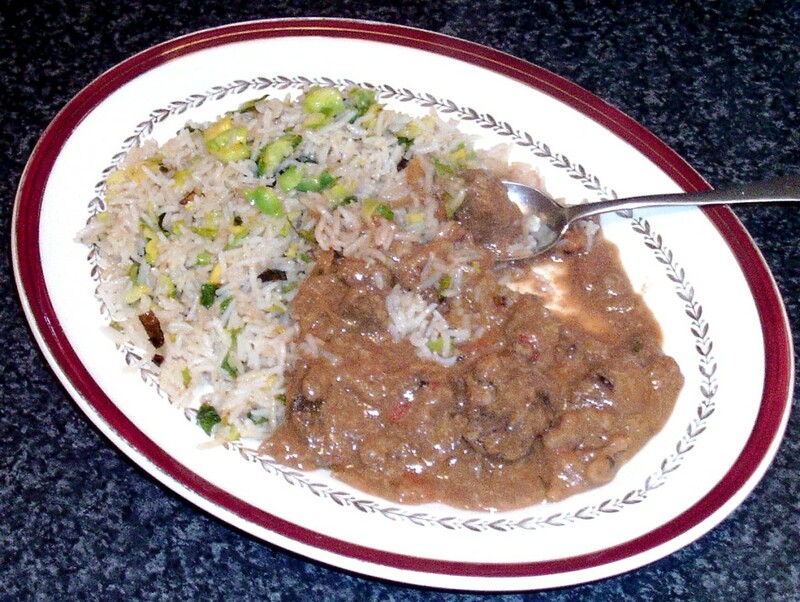 Plate the rice before arranging the kangaroo rogan josh either on top or alongside. Hello, Kenna and thank you. I'm glad that you like these ideas and very much that your daughter enjoys sprouts. 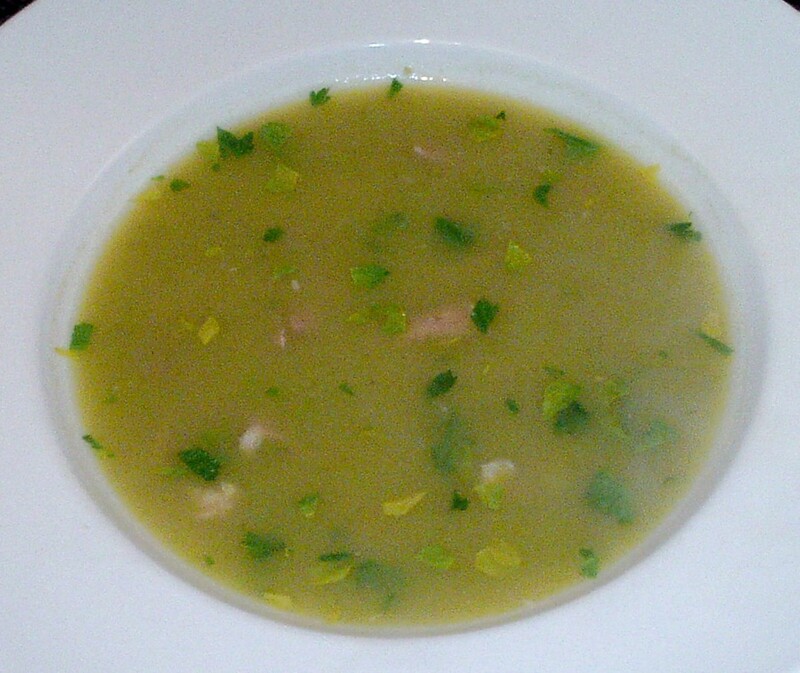 The soup worked particularly well with the celery leaves complementing the sprouts perfectly. I hope you do particularly give that one a try and enjoy it as much as I did and the other people I let try it. 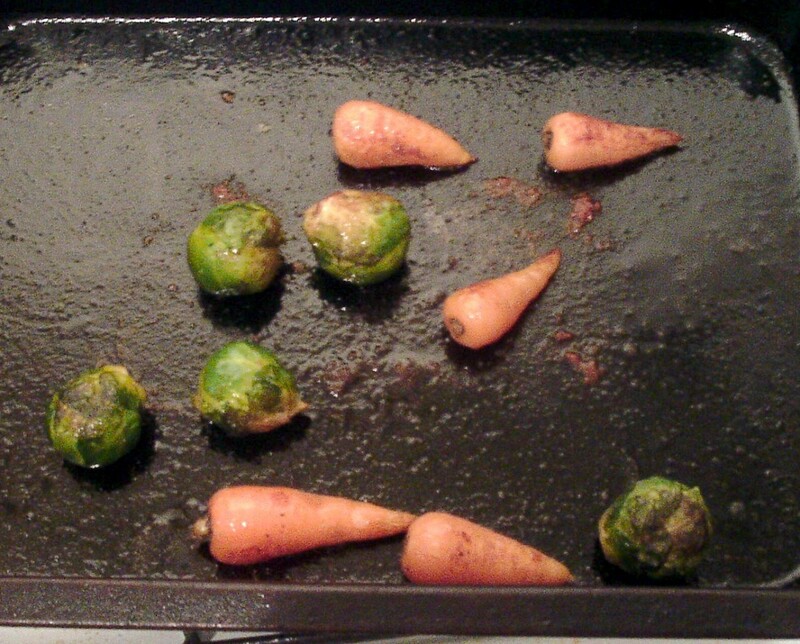 I never cared for Brussel sprouts but my daughter loves them. These recipes are wonderful. I like the idea of the soup. I'd make it, though, without meat since my daughter is vegan. My daughter had them roasted and fried. She gave me a bite and I was reluctant at first. It was so flavorful. Hi, Peggy. 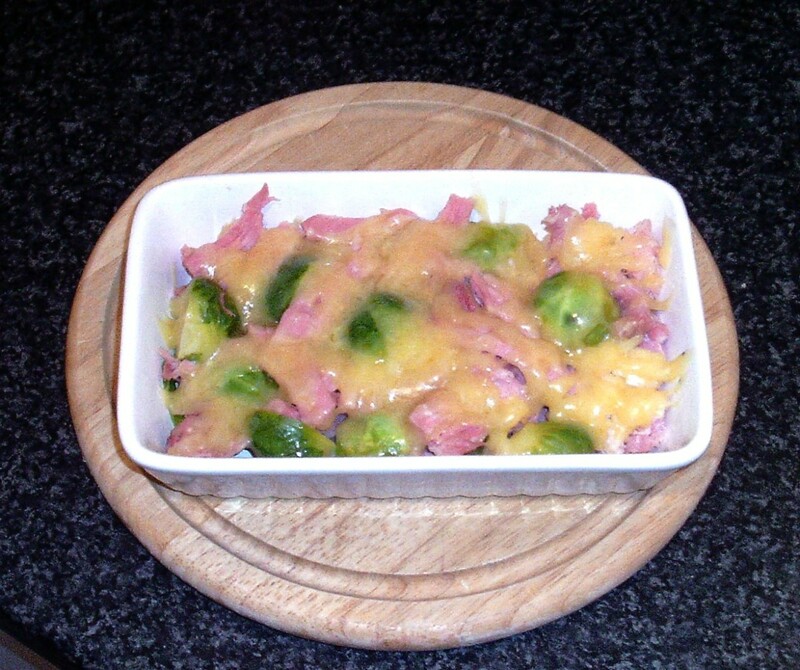 Yes, that's another couple of great ideas you suggest for sprouts, further proving just how versatile they can be. Thank you and I hope you can finally know success in getting your husband to eat and enjoy these delicious vegetables. Hi, Mary, thank you and I'm glad you like some of these ideas. 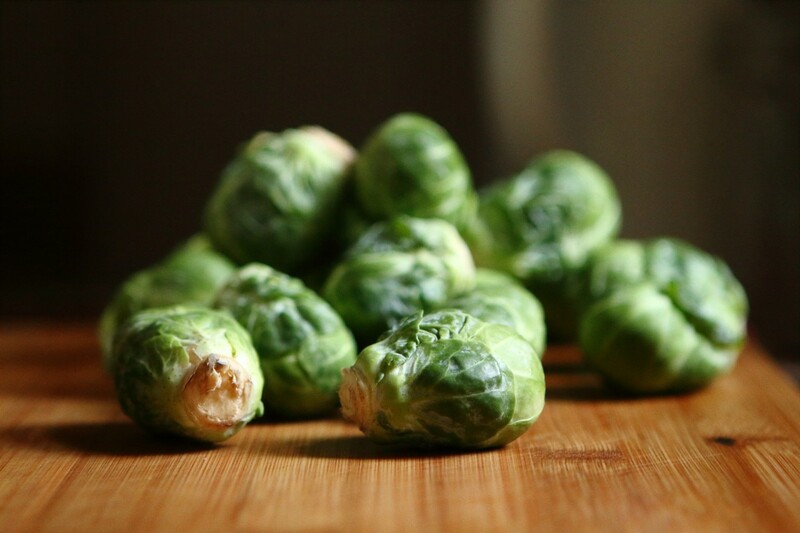 You are so right about so many people being stuck in their ways and that is one of the biggest challenges in getting to try Brussels sprouts different ways. Hope you give it a go and are successful! 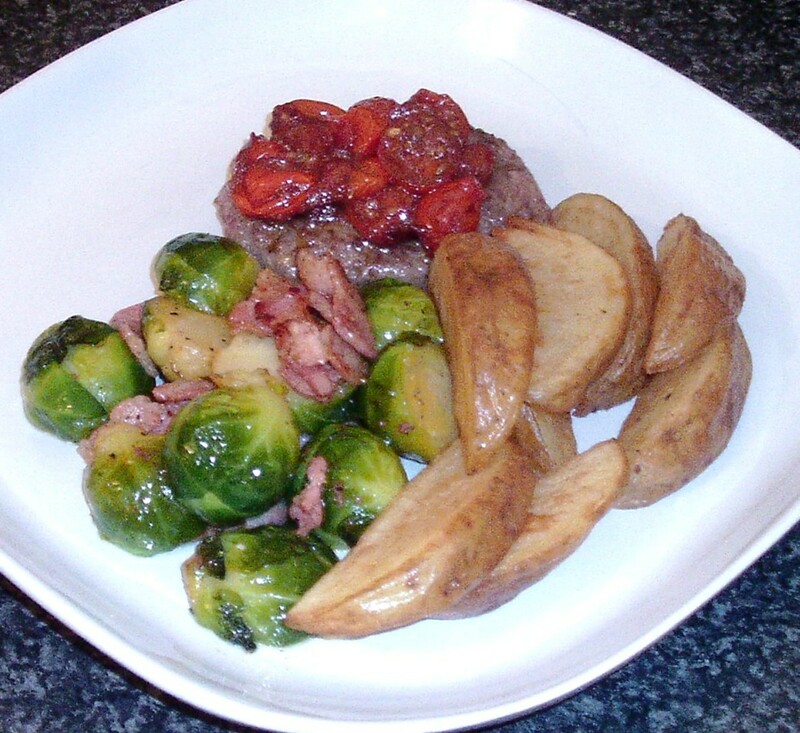 You have really given us so many good sounding recipes in which to use brussels sprouts. I really enjoy them caramelized. Wish I could encourage my husband to eat them. He does not enjoy the taste although he will eat cabbage. Another way is to shred them and use them raw in salads. 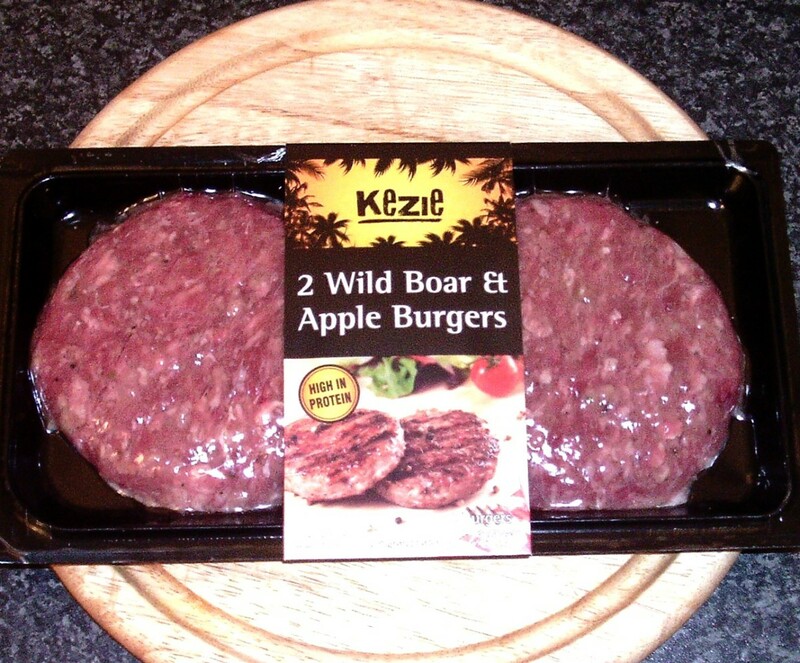 I am one who isn't a big fan of them as when I have had them they are as you say, overcooked and mushy. 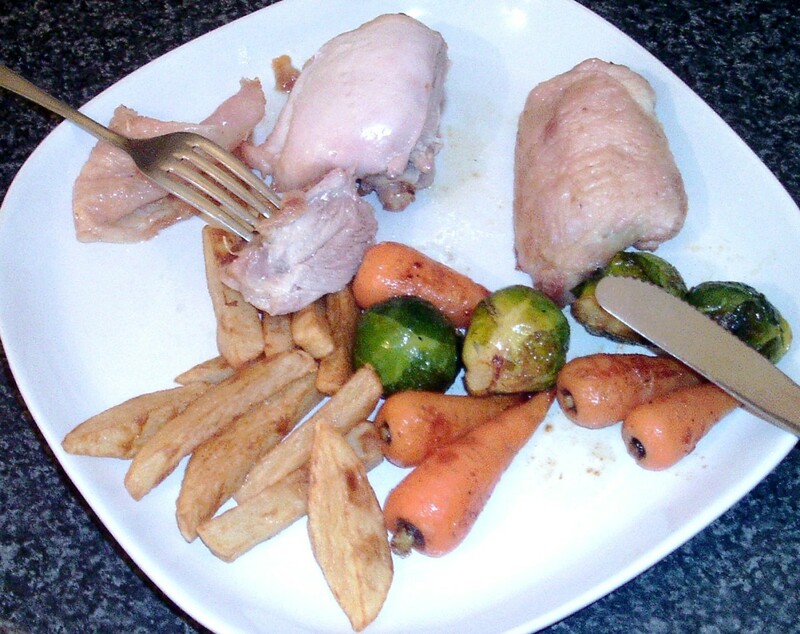 I like your ideas of incorporating them into other meals whether sliced or left whole. I have always left the door open for them as I know it wasn't them, it was merely the way they were prepared. What I have found, is people (the men I cook for) are so often stuck in their habits they don't want to try them in a different way. I prefer my cooked veg, still firm, not like something served to a bunch of nursing home residents who don't have teeth. A great article about one of Britain's most loved and most hated veg.